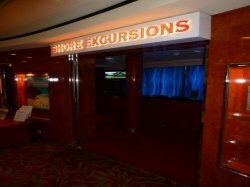 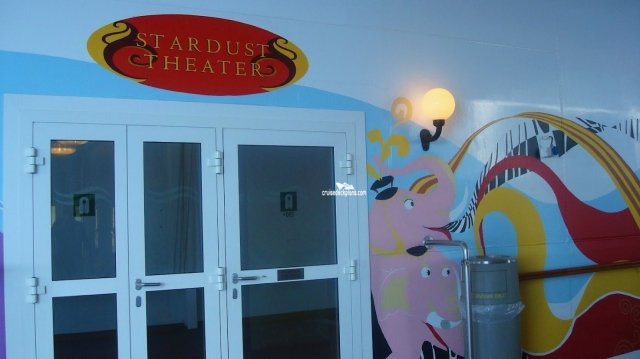 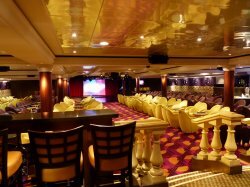 The ship's second main show lounge now called BLISS LOUNGE, can seat 405 guests and has horizontal windows in the floor allowing guests to enjoy a fantastic view. 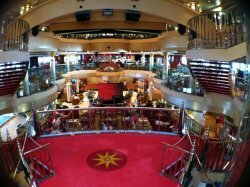 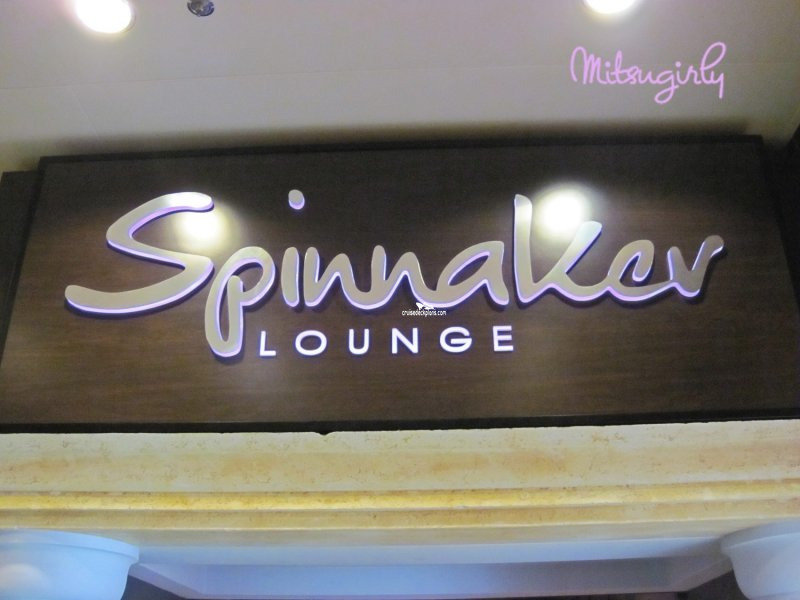 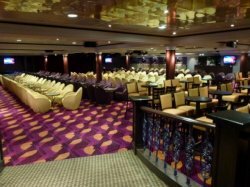 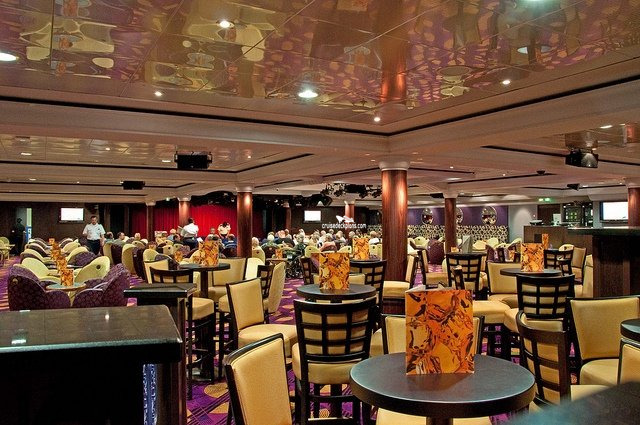 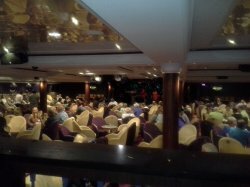 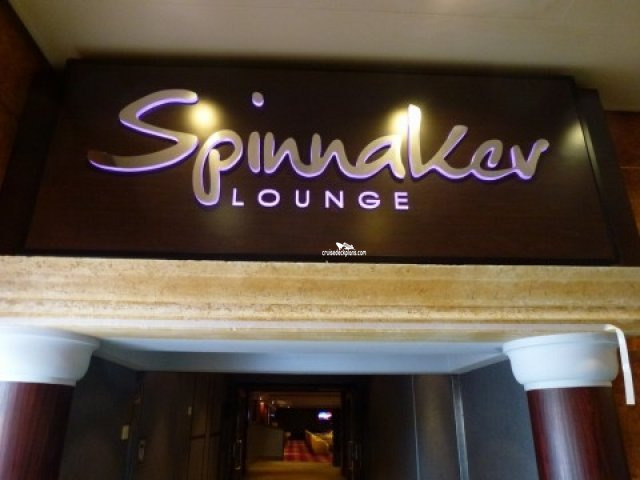 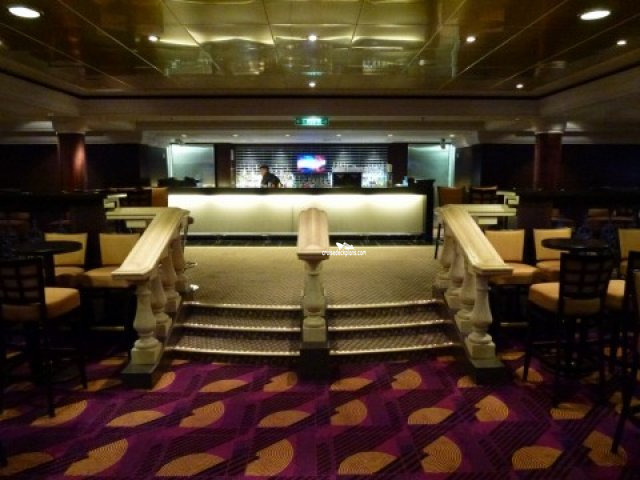 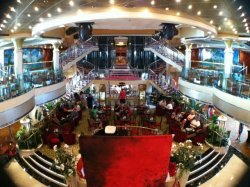 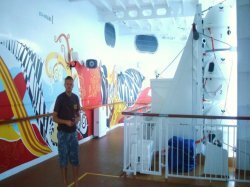 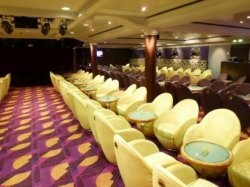 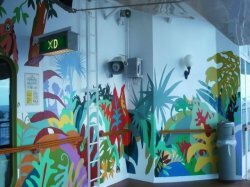 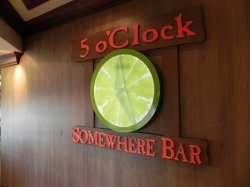 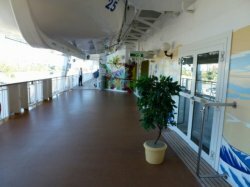 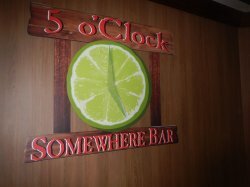 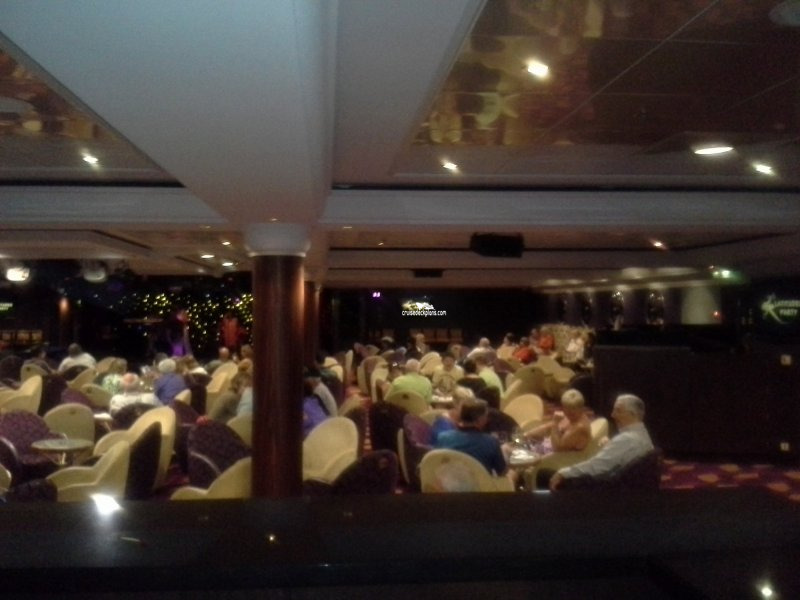 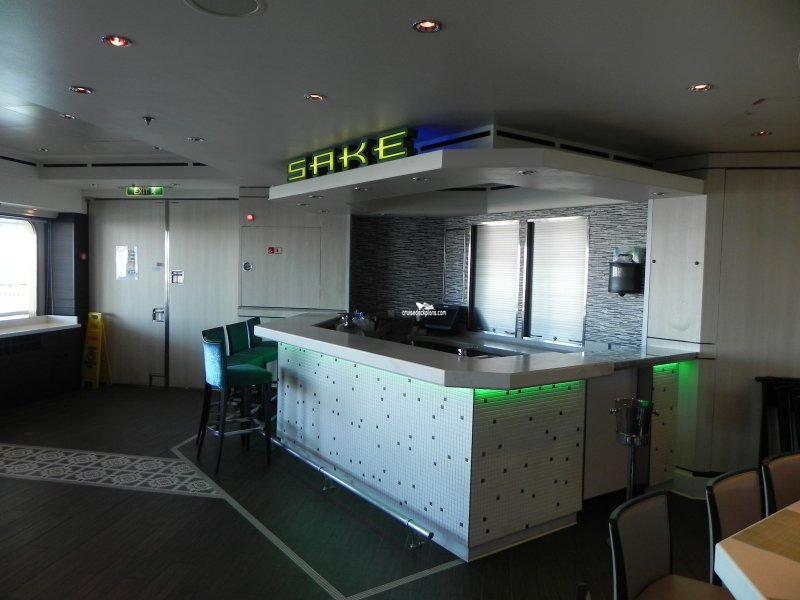 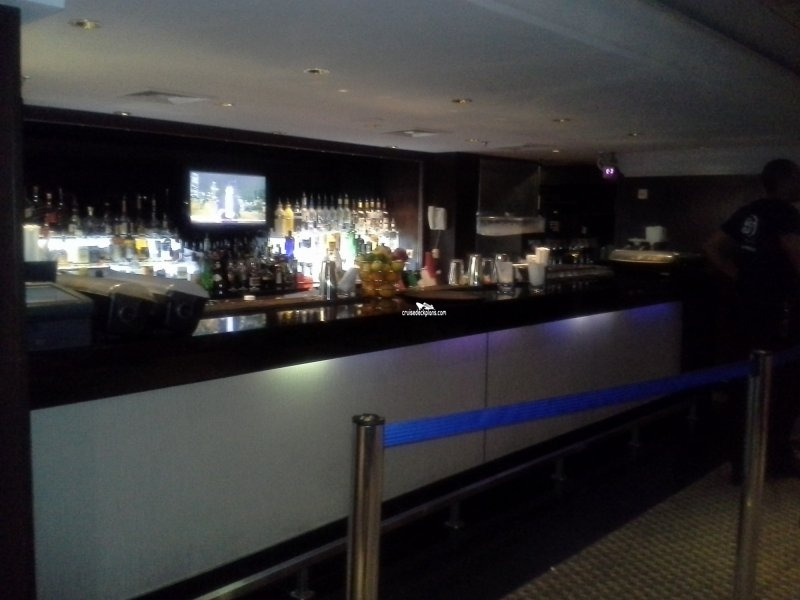 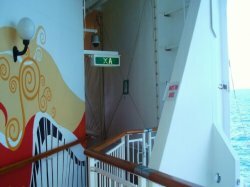 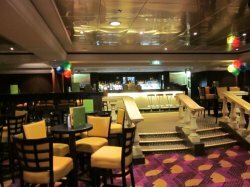 Featuring its own bar and dance floor it becomes home to the ship's DJ later on in the night with dancing into the small hours whilst during the day it is the location for bingo, dance classes and game shows including the Not-So-Newlywed show. 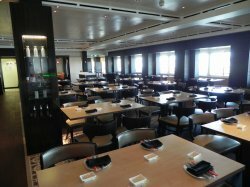 Seats 92 guests and is open from 10am to close. It is a traditional English Pub with large screen TV’s airing sporting events and proper beer on tap. 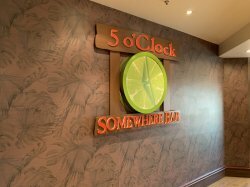 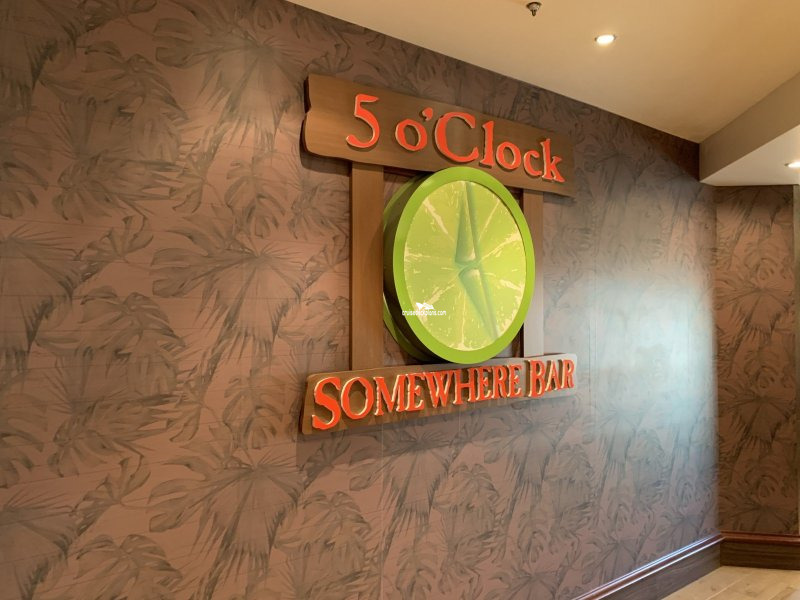 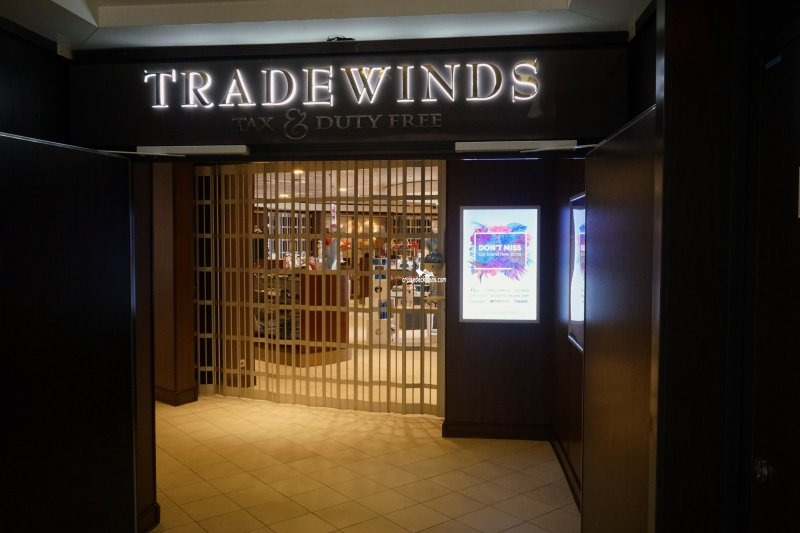 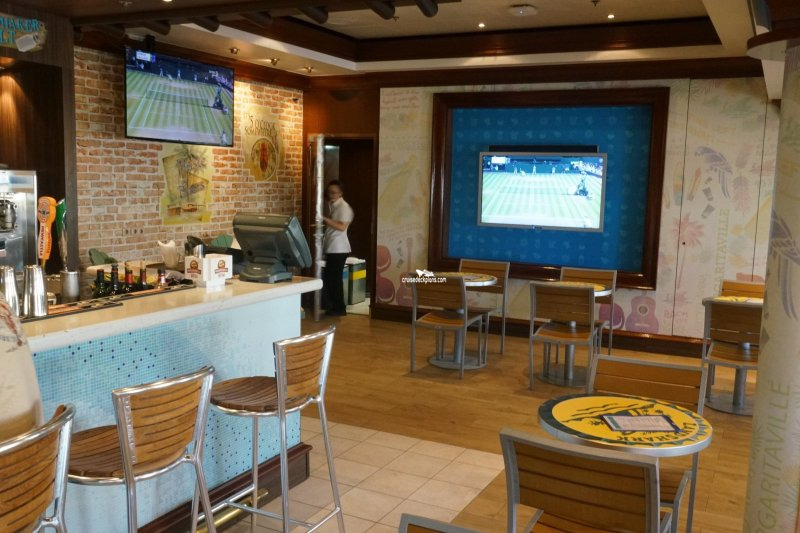 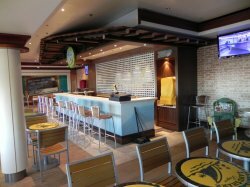 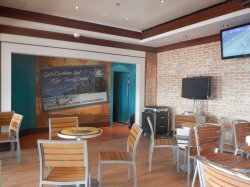 With events such as trivia, digital scavenger hunts, karaoke, Wii bowling competitions and beer tasting taking place and fresh bags of popcorn available, this is a popular lively location for guests to enjoy. 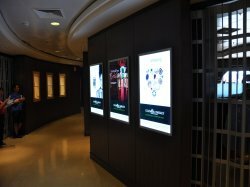 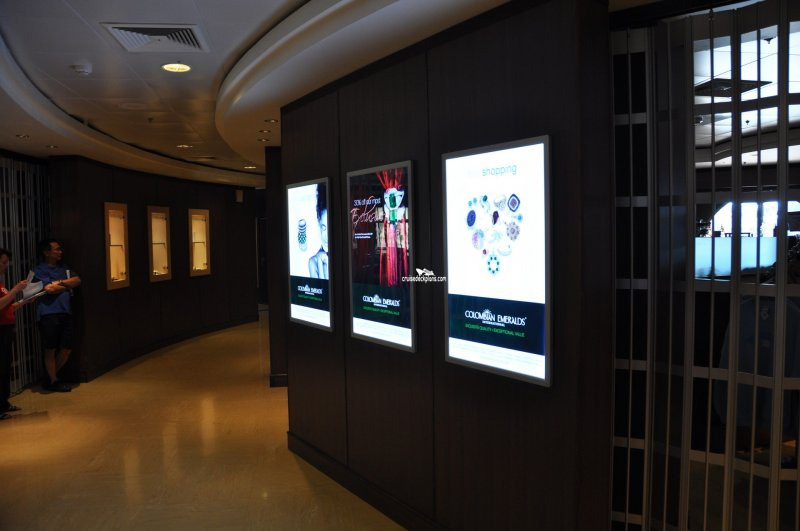 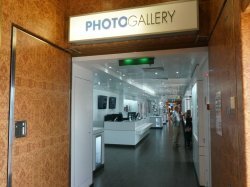 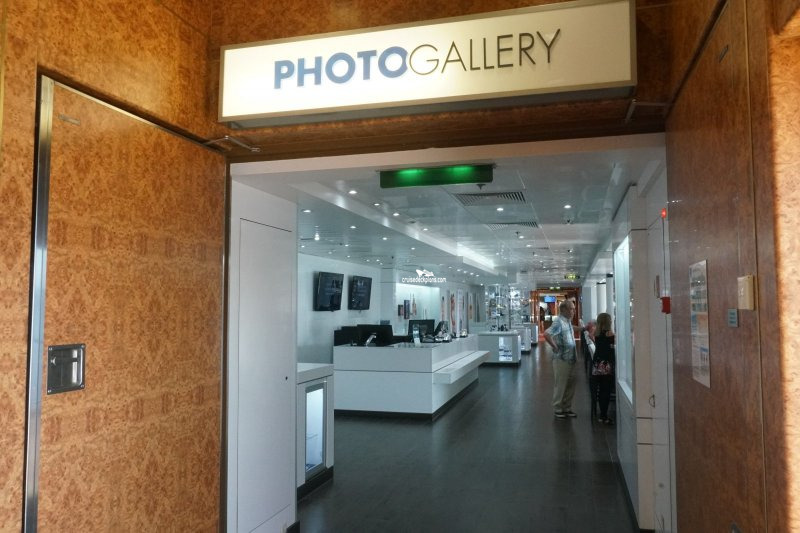 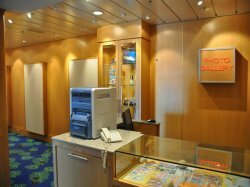 Displays all of the portraits taken by the ship's official photographers which guests can view and purchase along with digital cameras, accessories, media cards and batteries. 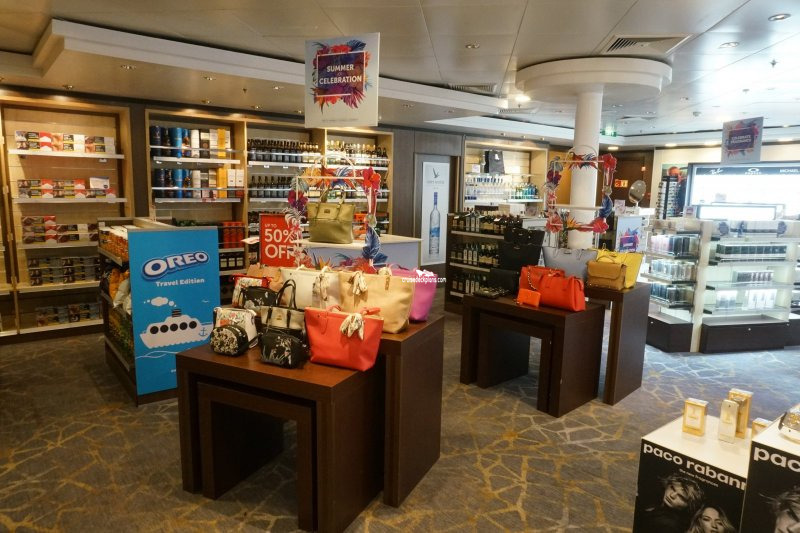 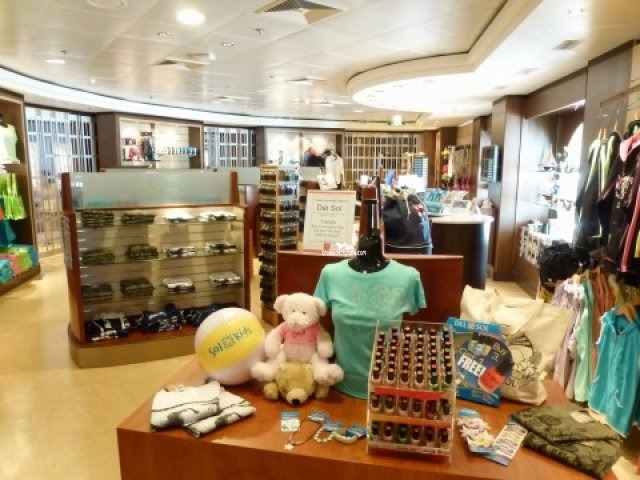 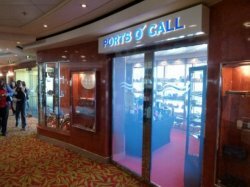 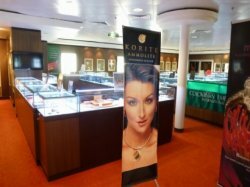 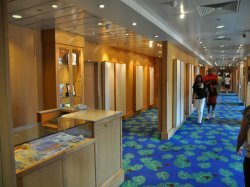 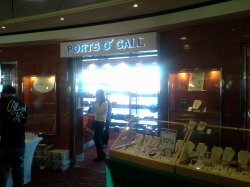 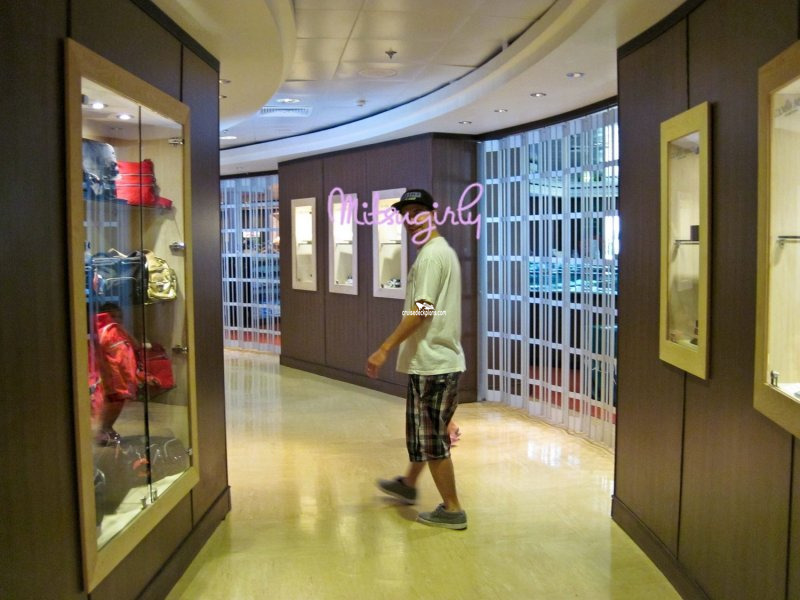 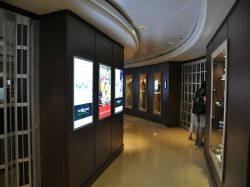 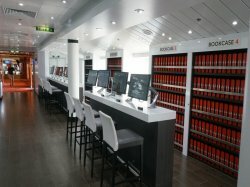 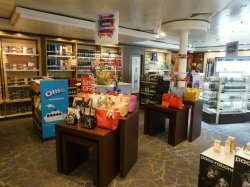 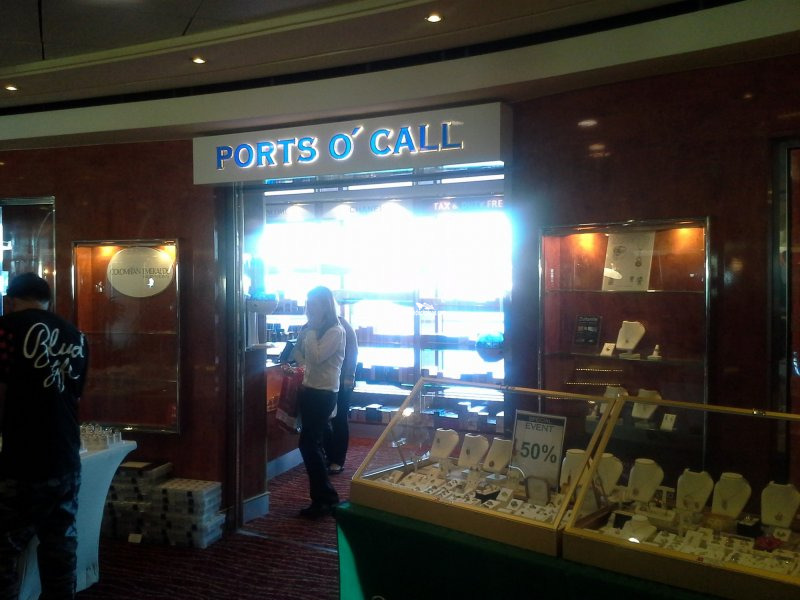 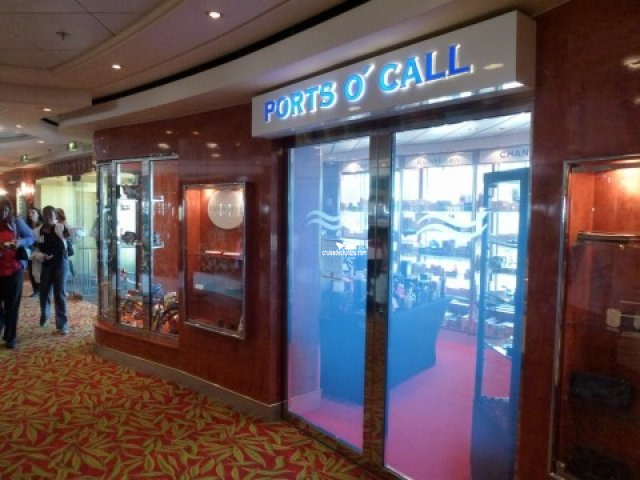 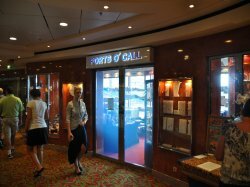 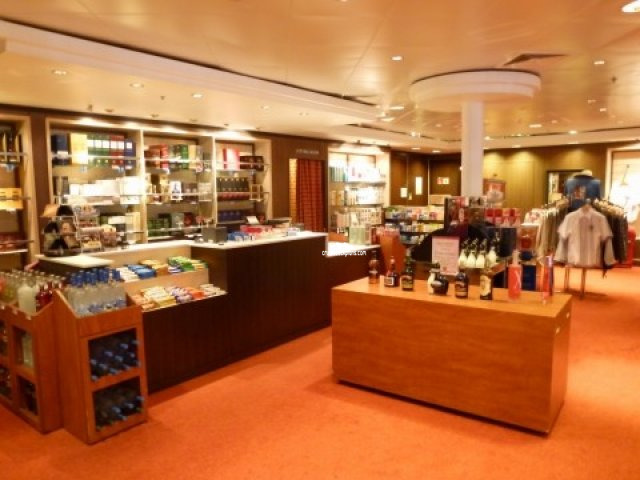 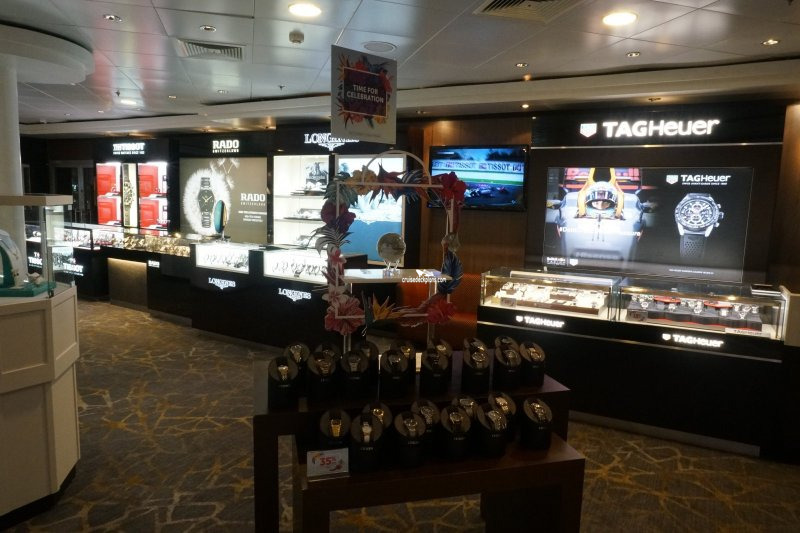 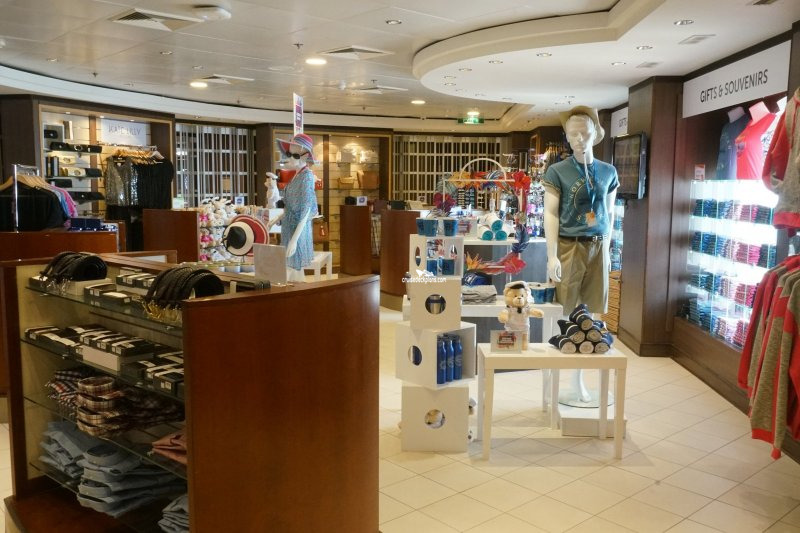 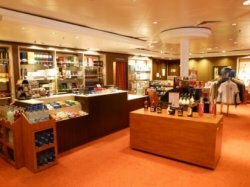 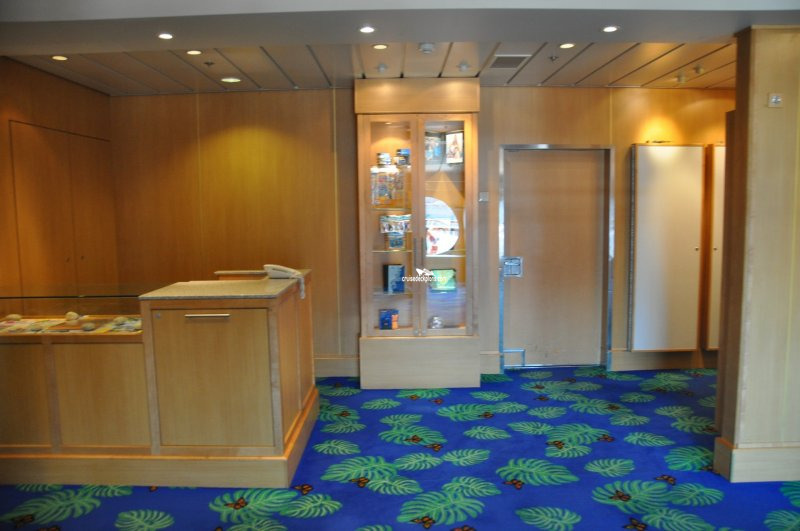 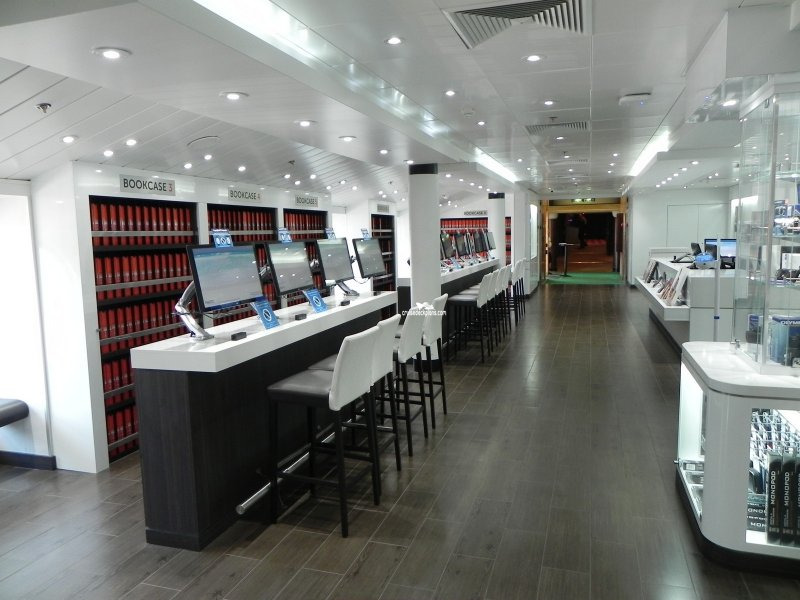 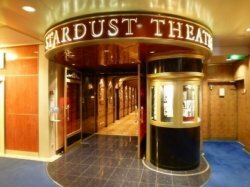 The ship's gift shop selling items including souvenirs, jewelery, watches, brand name cosmetics and perfumes including Lancôme and Chanel. 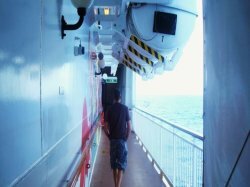 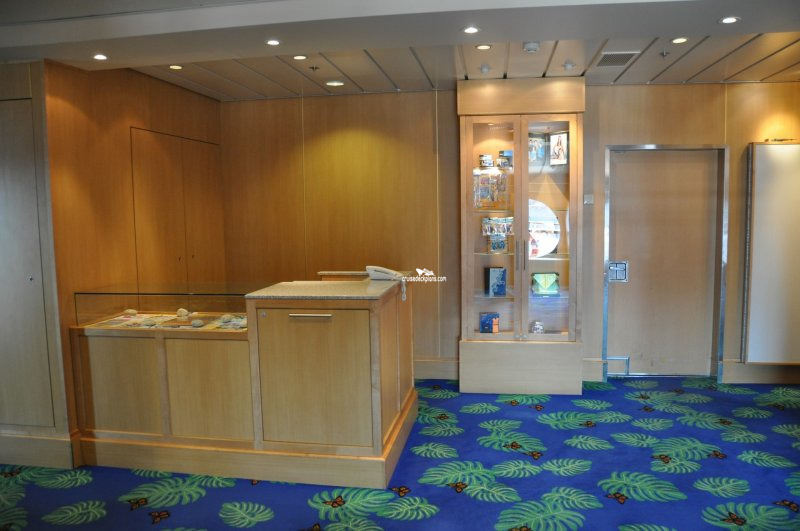 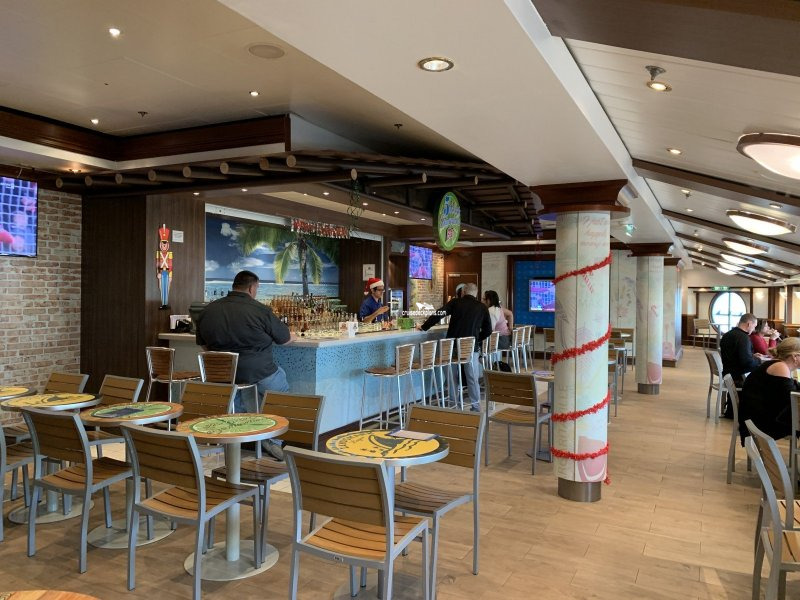 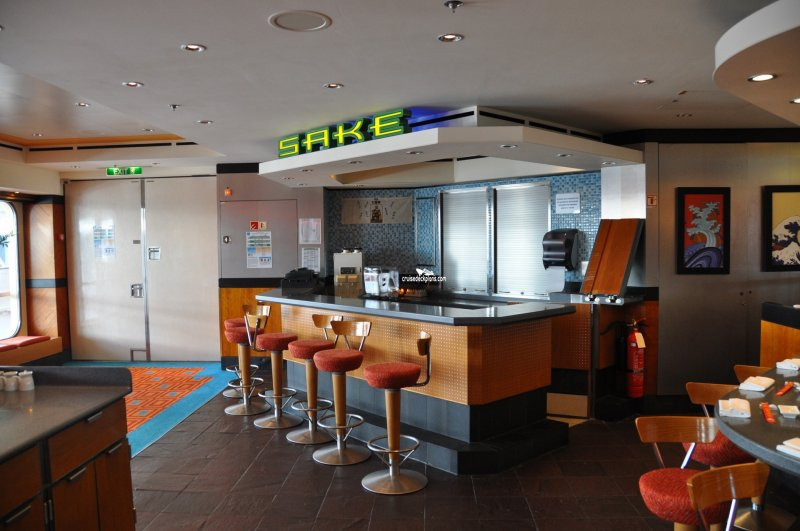 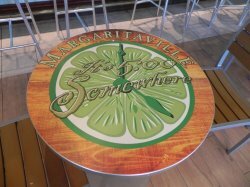 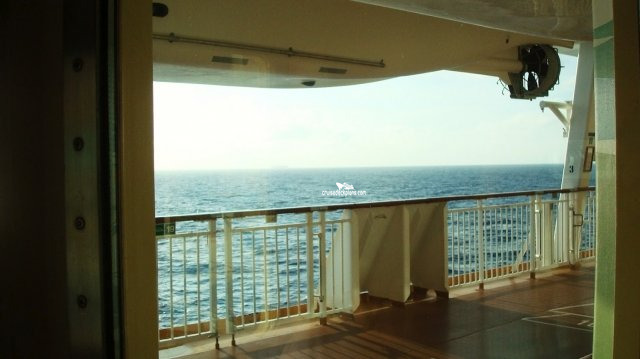 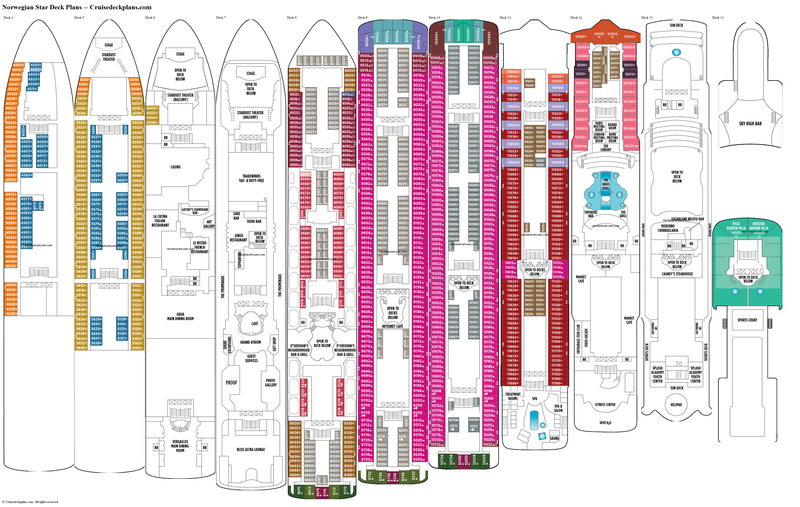 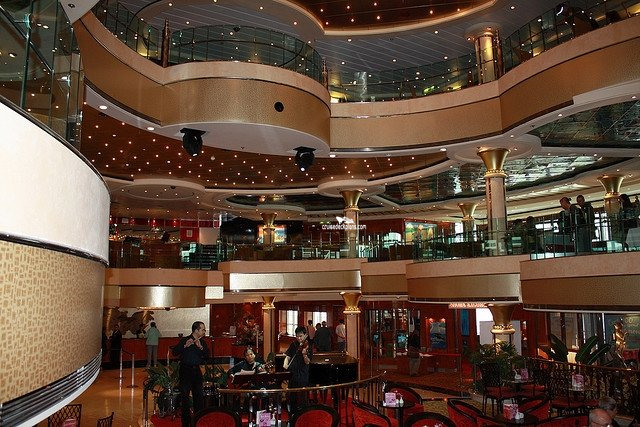 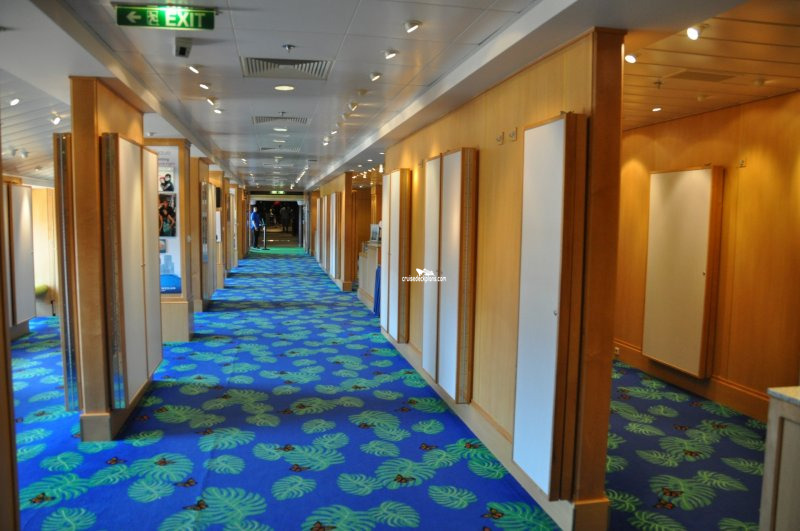 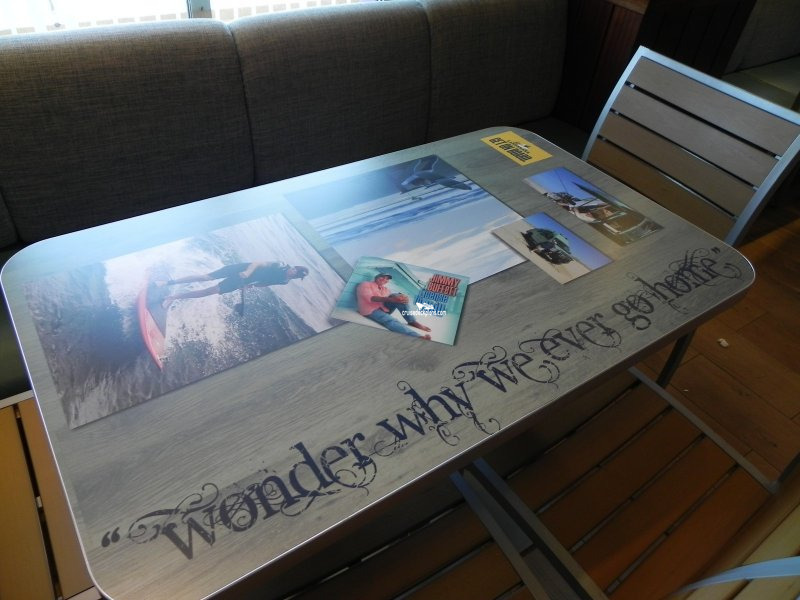 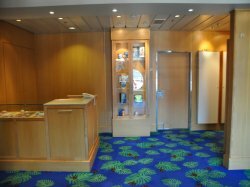 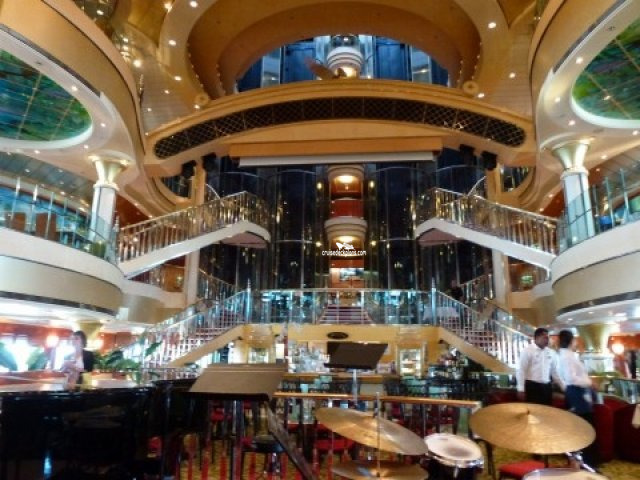 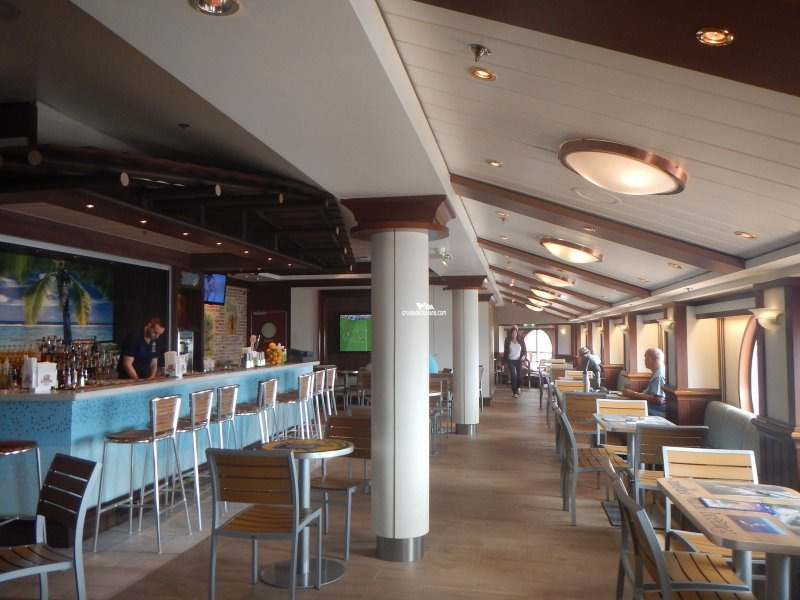 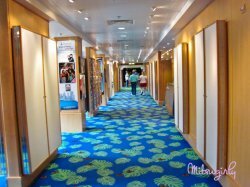 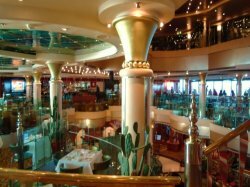 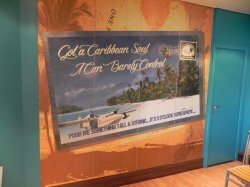 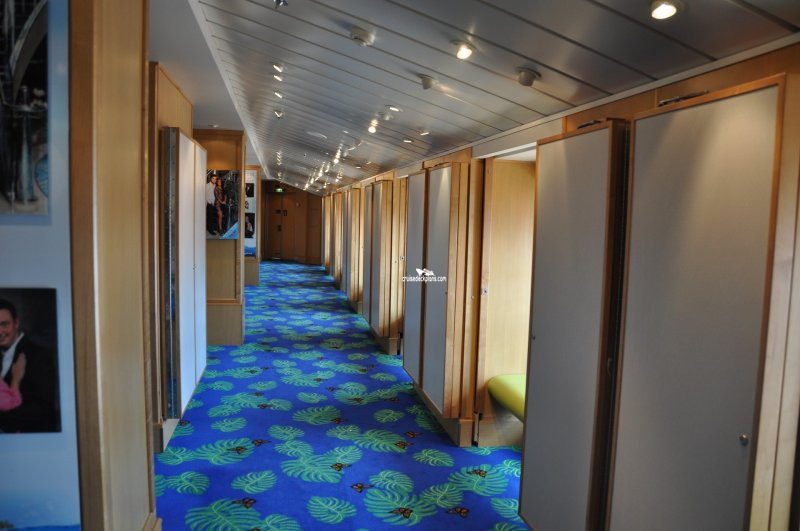 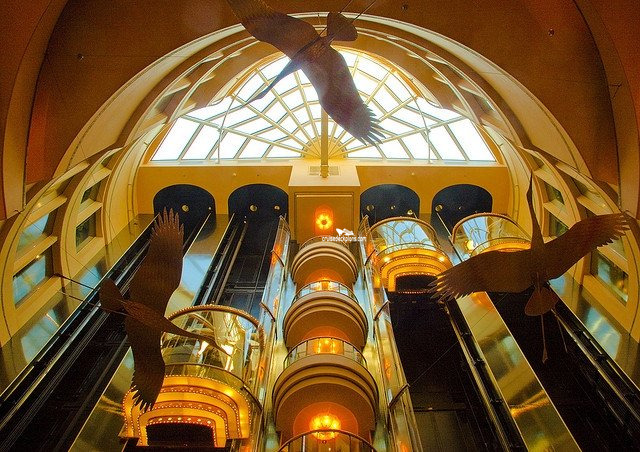 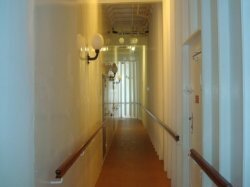 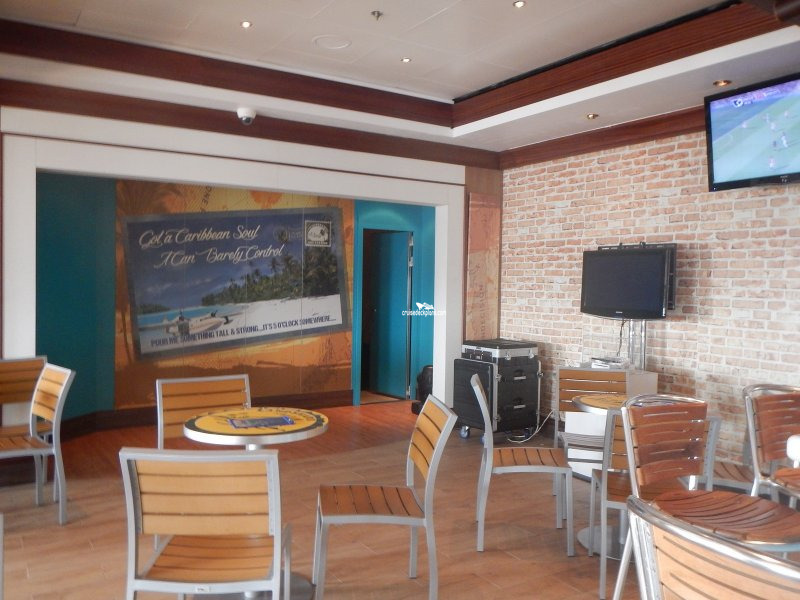 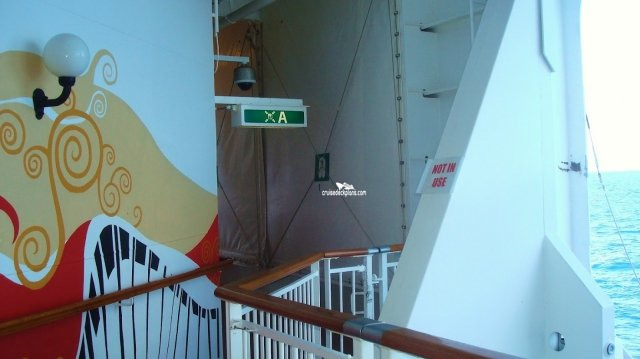 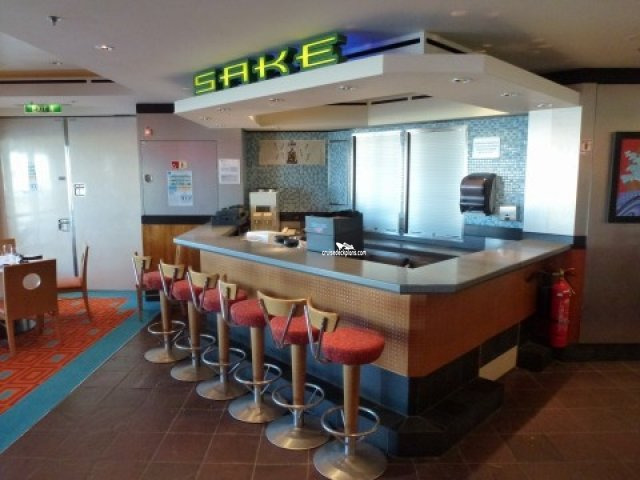 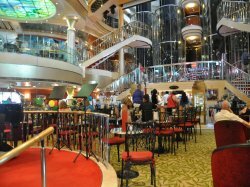 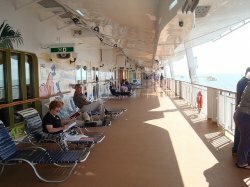 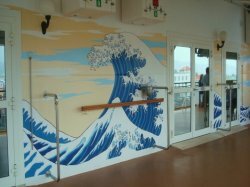 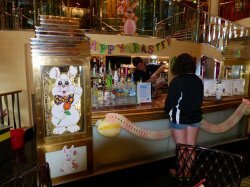 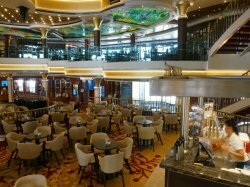 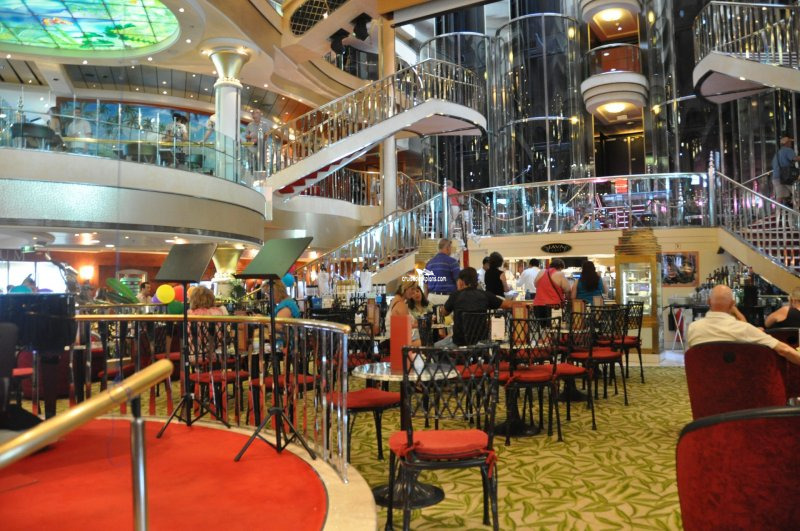 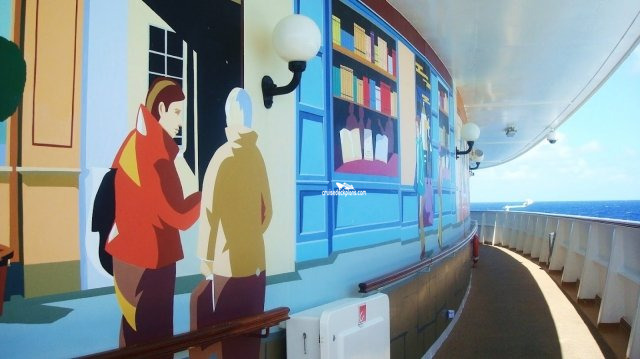 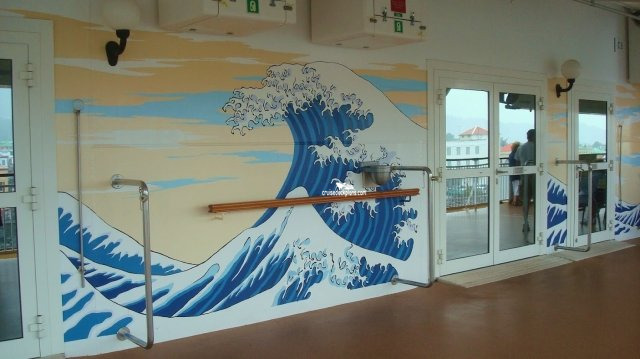 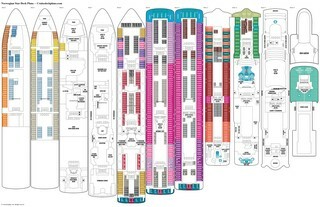 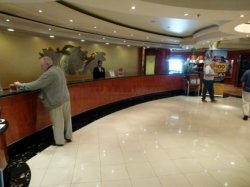 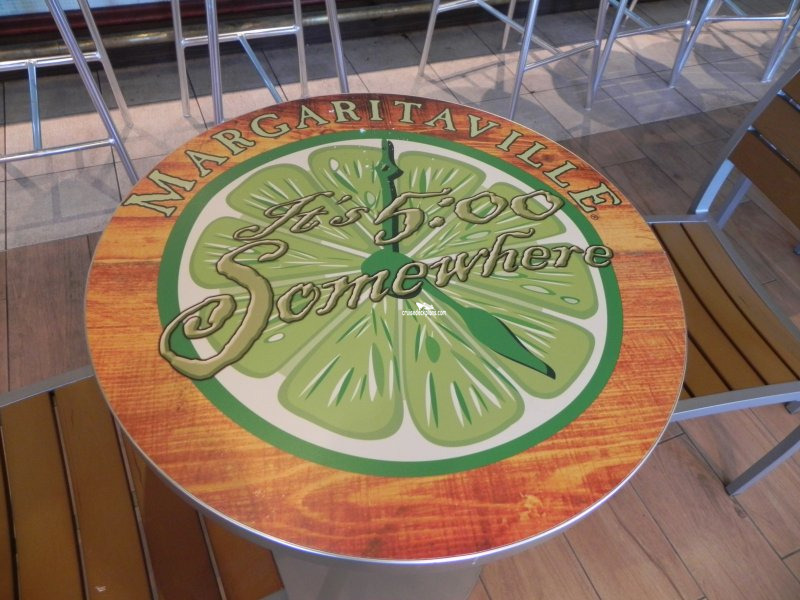 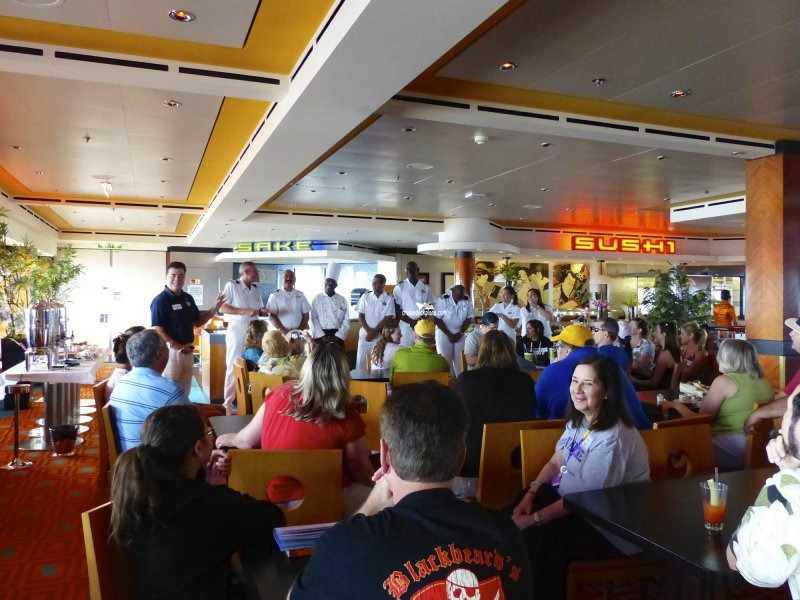 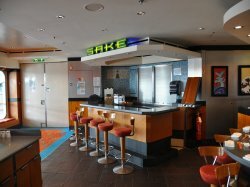 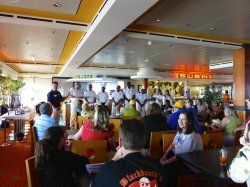 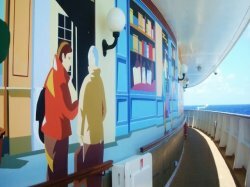 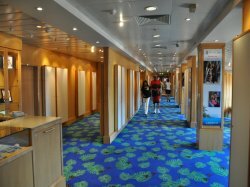 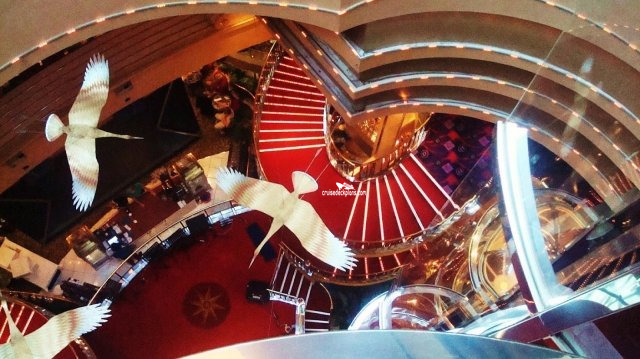 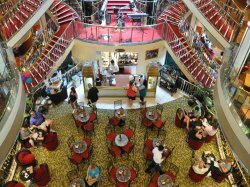 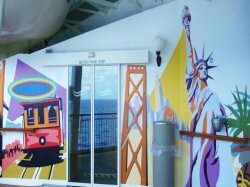 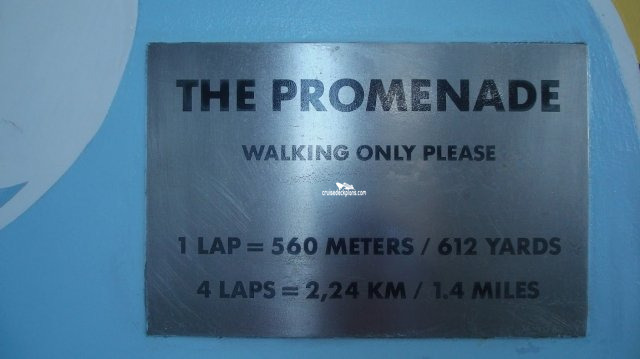 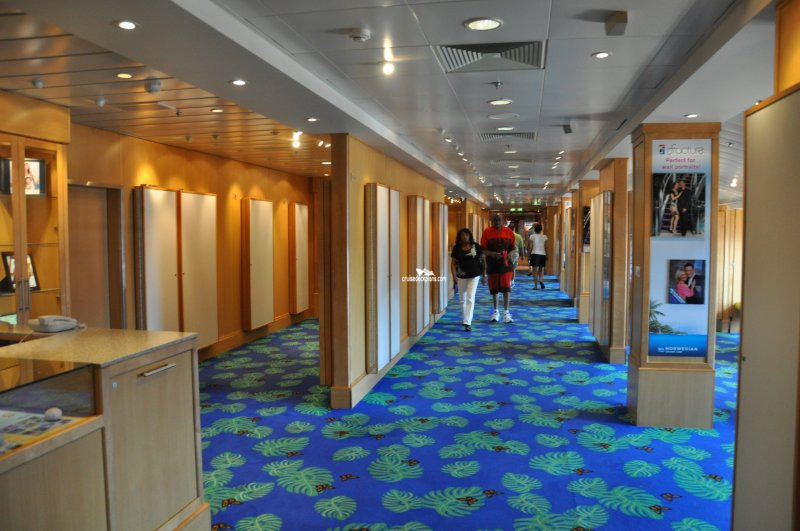 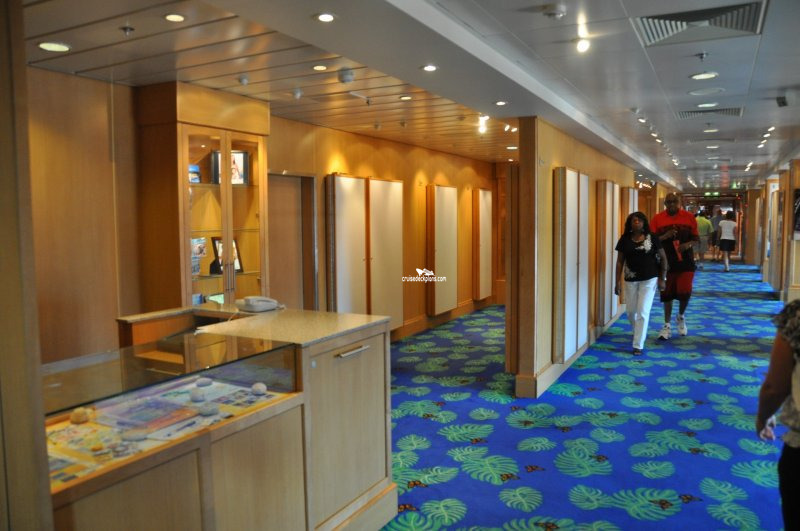 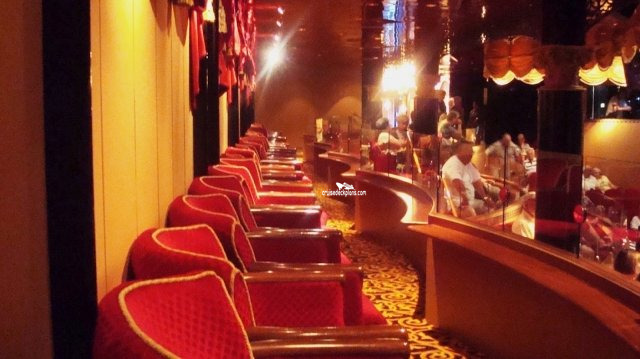 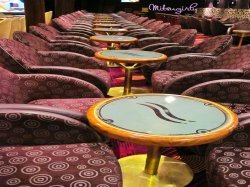 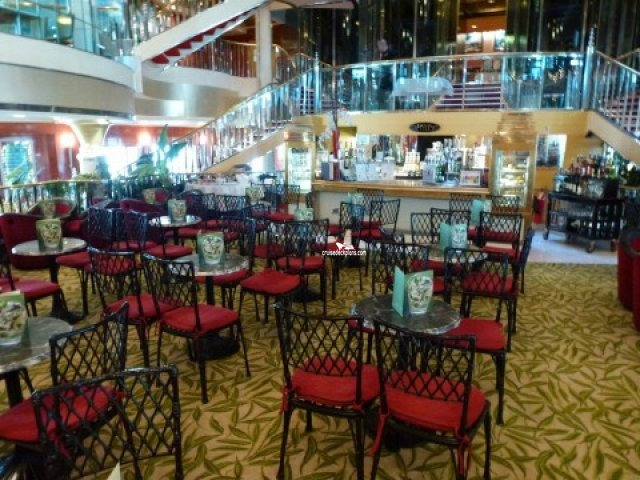 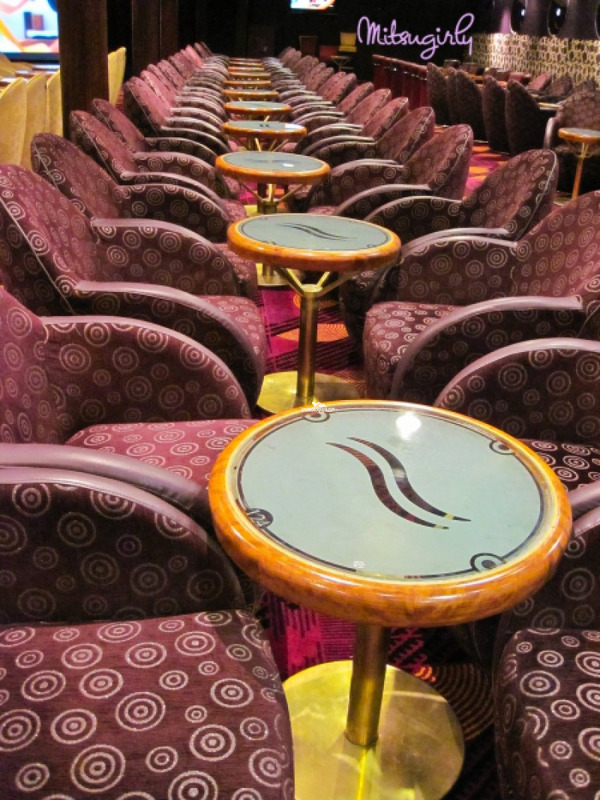 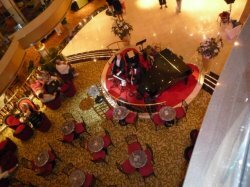 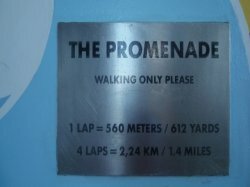 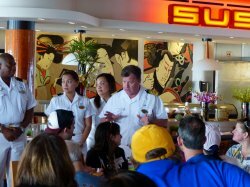 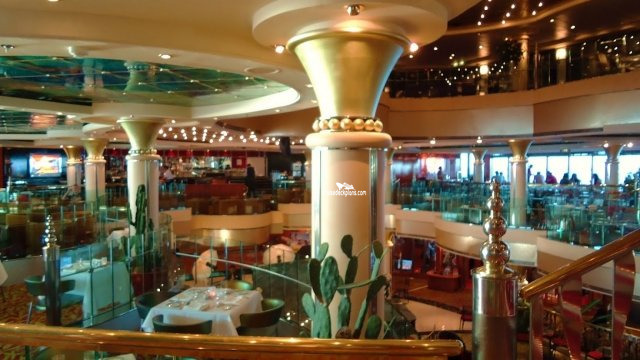 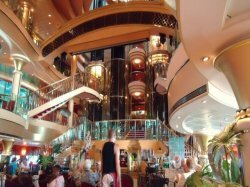 Opens from 7am to close and is the ship's coffee bar, accommodating 73 guests. 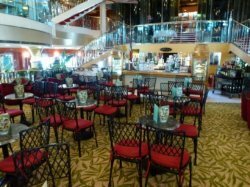 Serving a wide variety of speciality coffees from double, vanilla and extra hot latte with extra foam and teas for a charge, the accompanying muffins, cupcakes, scones, cookies and pastries are complimentary. At night cocktails and wine are also available. 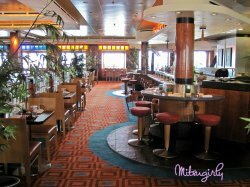 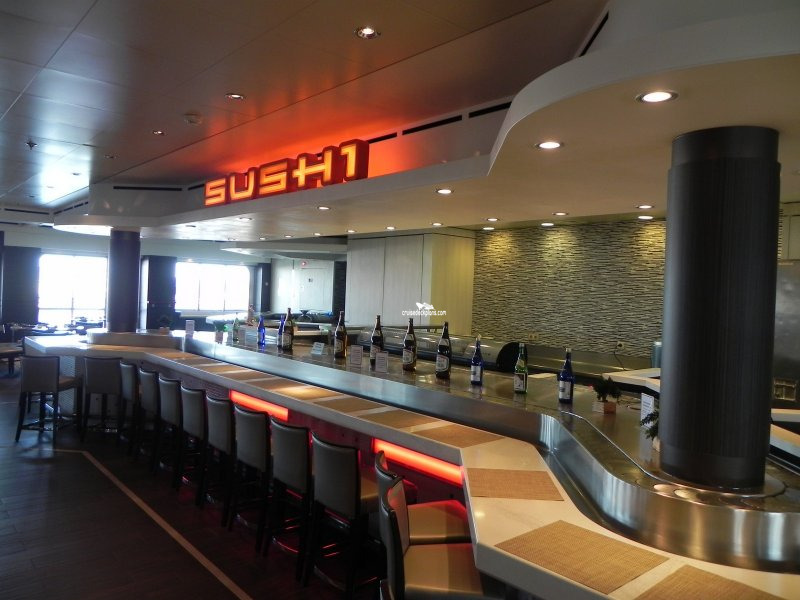 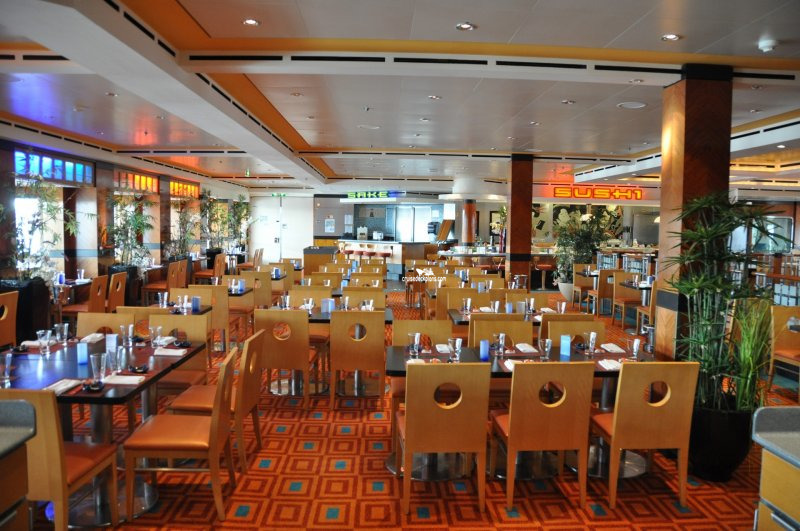 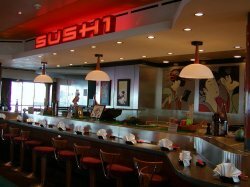 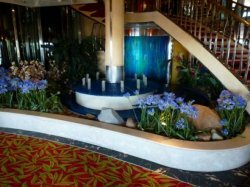 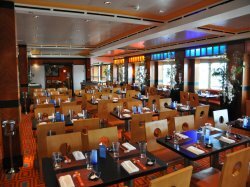 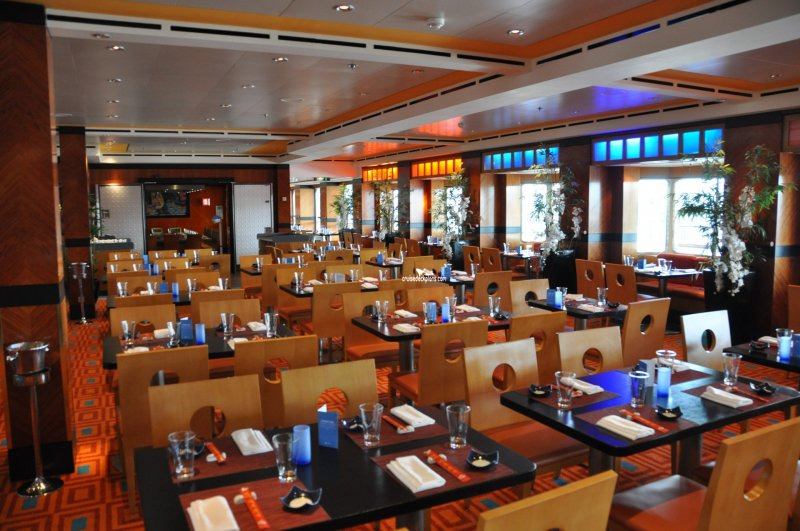 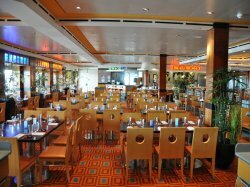 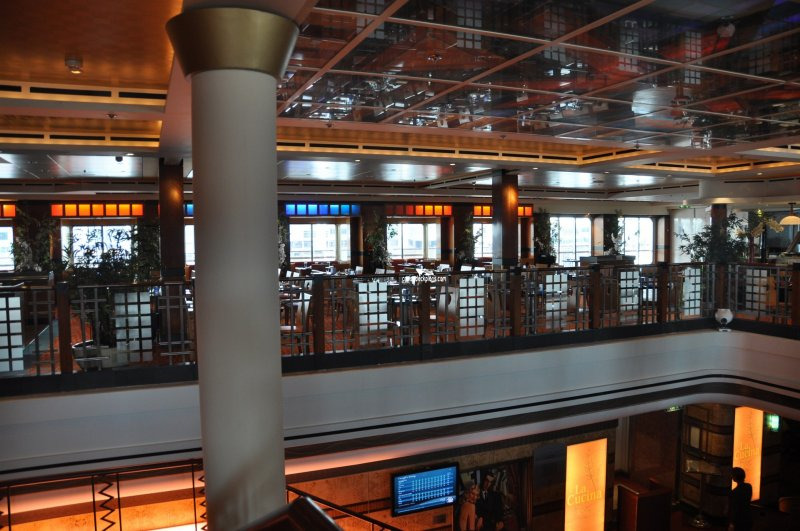 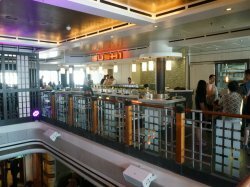 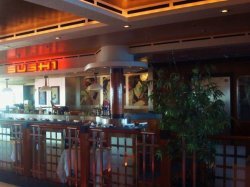 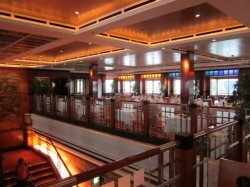 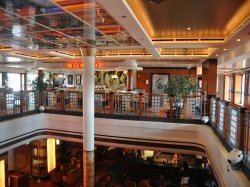 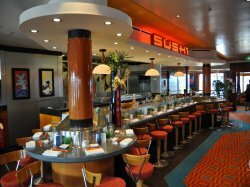 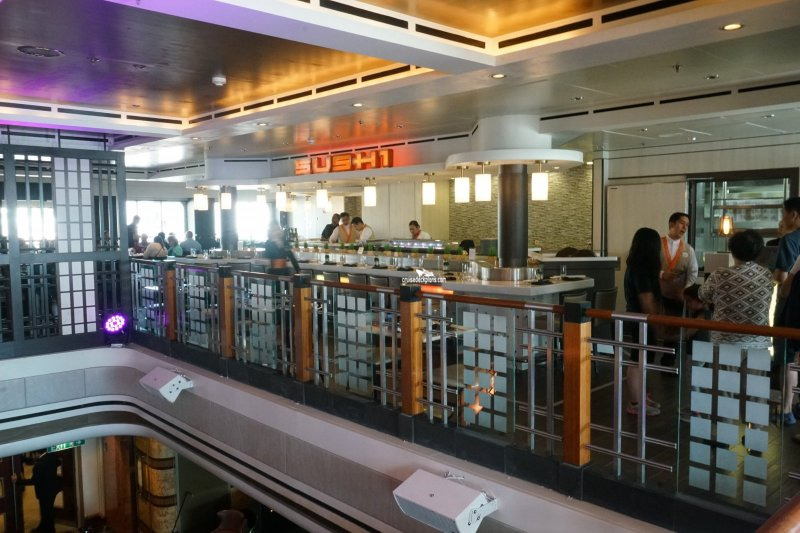 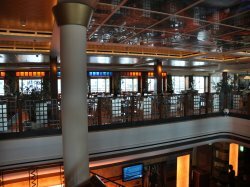 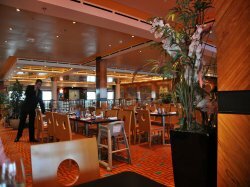 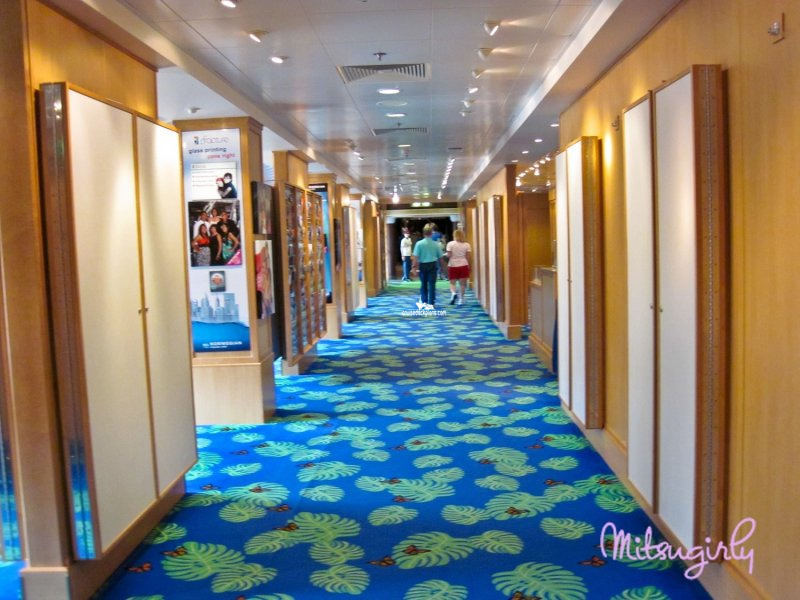 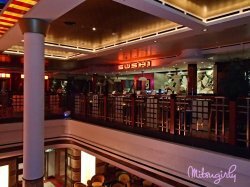 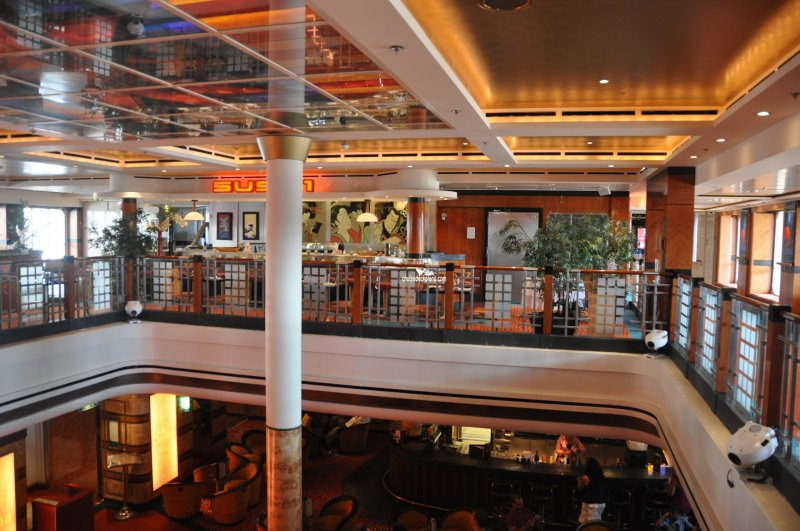 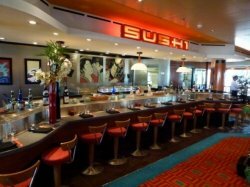 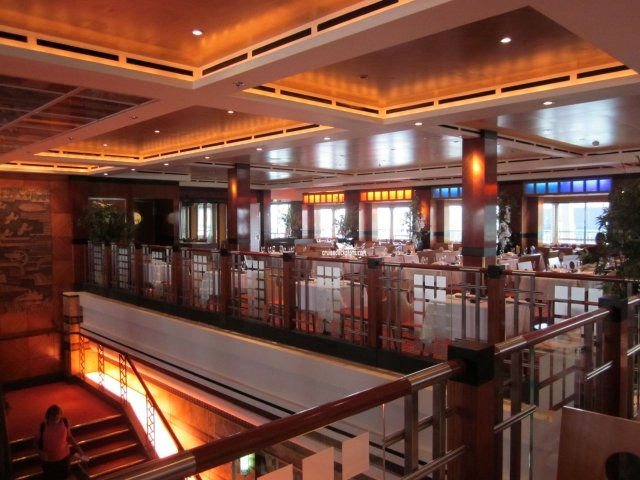 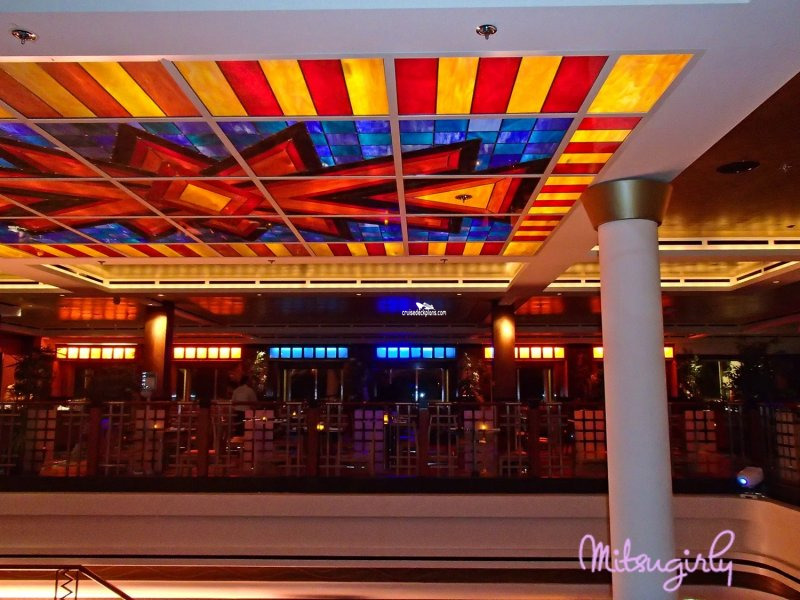 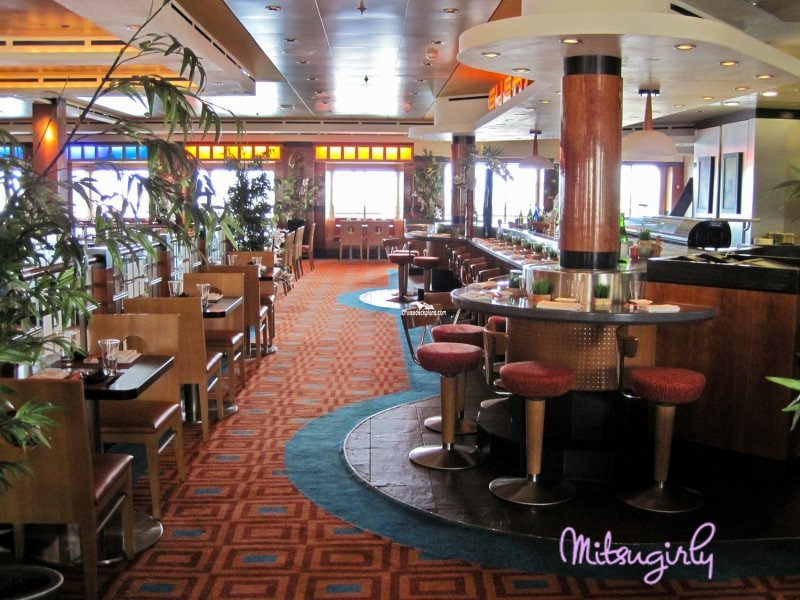 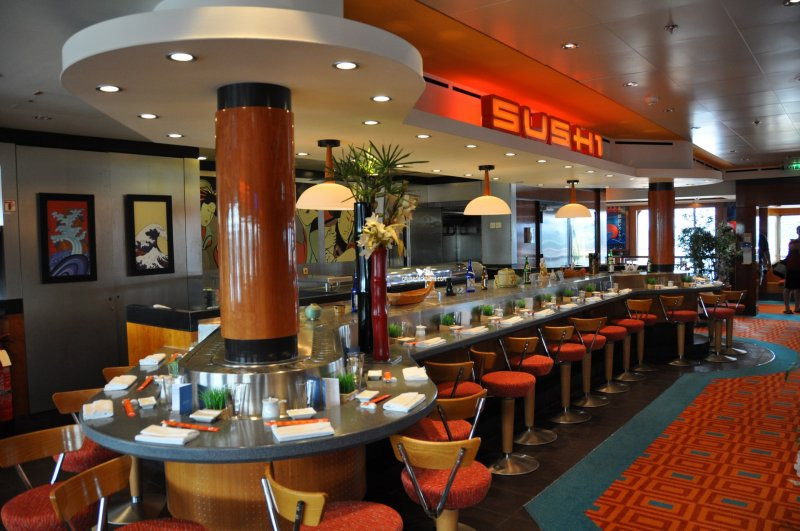 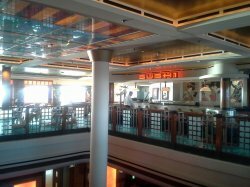 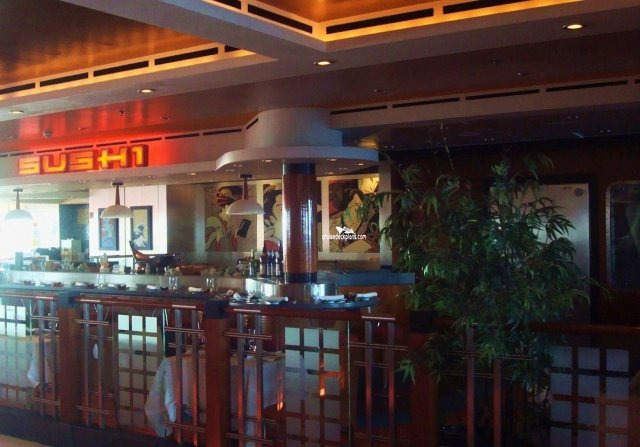 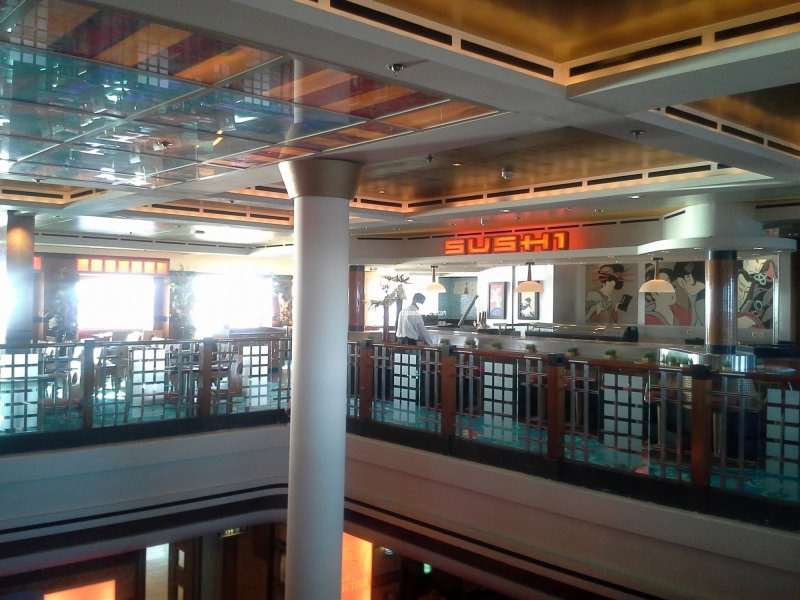 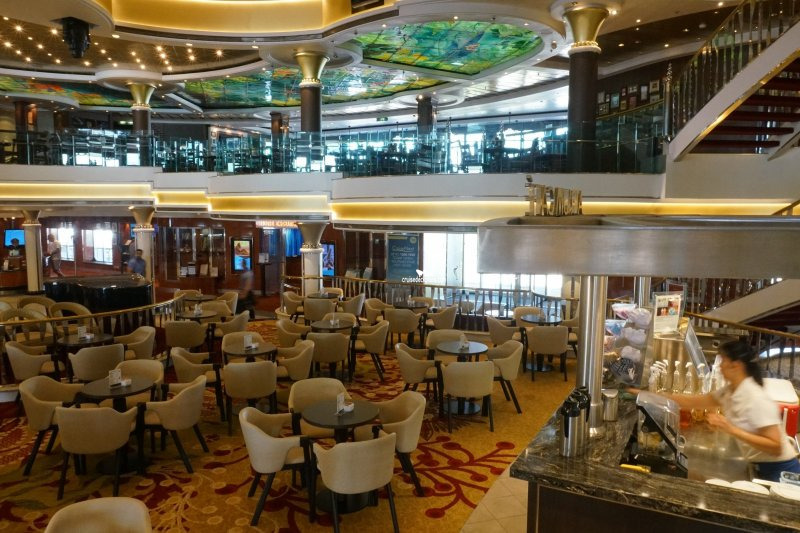 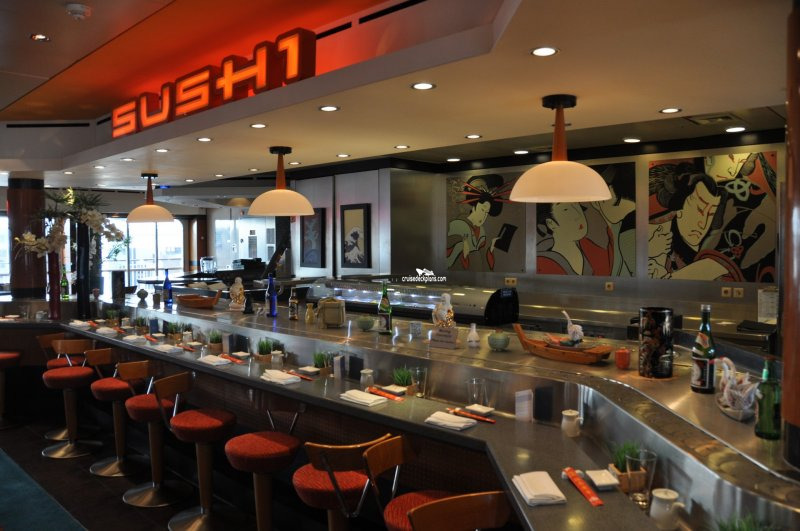 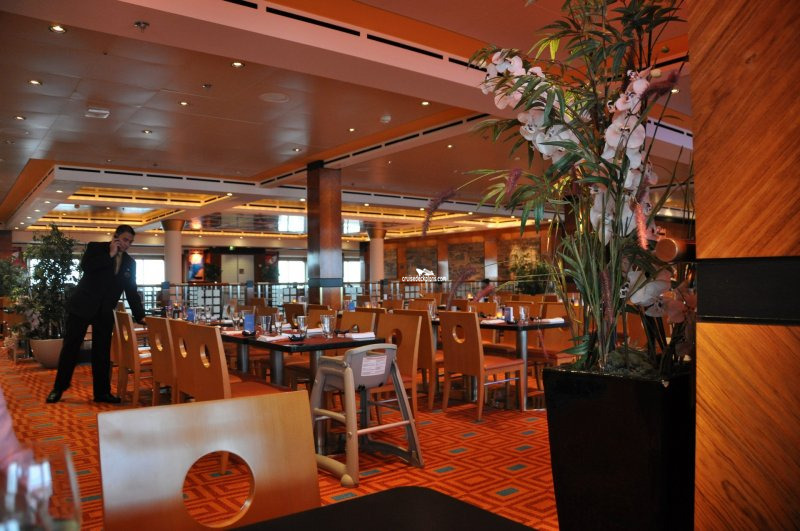 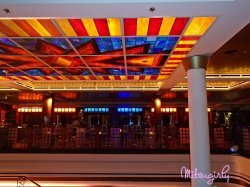 Norwegian Star’s Pan Asian restaurant serving Japanese, Thai and Chinese cuisine. 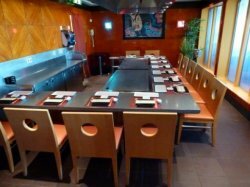 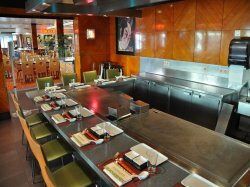 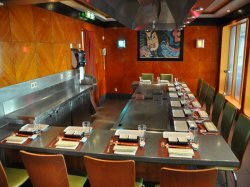 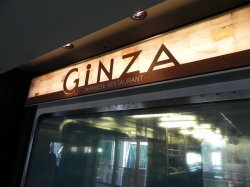 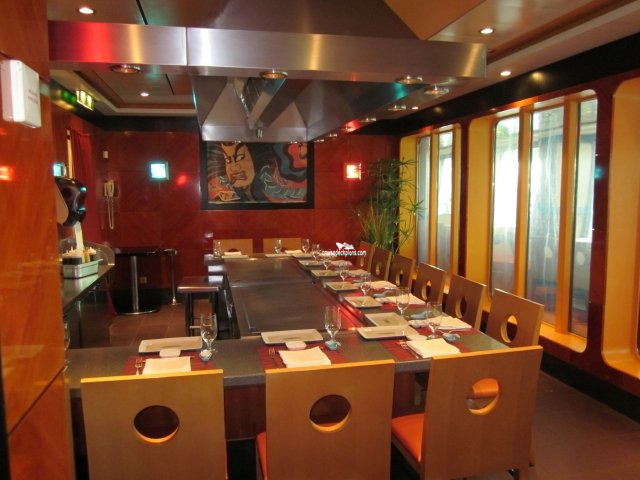 Ginza can accommodate 98 guests and with a cover charge of $15 per person. 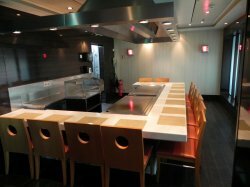 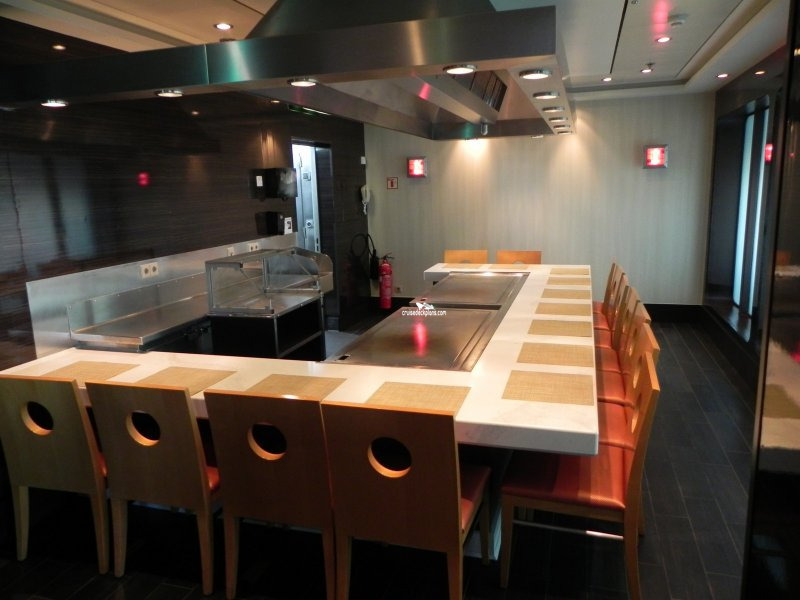 Has seating’s at 12pm, 5.00pm, 6.30pm and 8.00pm and 9.30pm and invites guests to sit around the central cooking area for an Asian dining experience where they watch the chefs show off their skills slicing and dicing whilst preparing meat, poultry, fish and vegetables on an iron “Teppan” griddle. 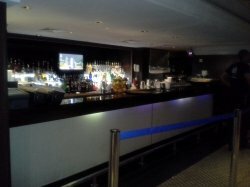 Open from 12pm to 1.30pm and 5.30pm to close. 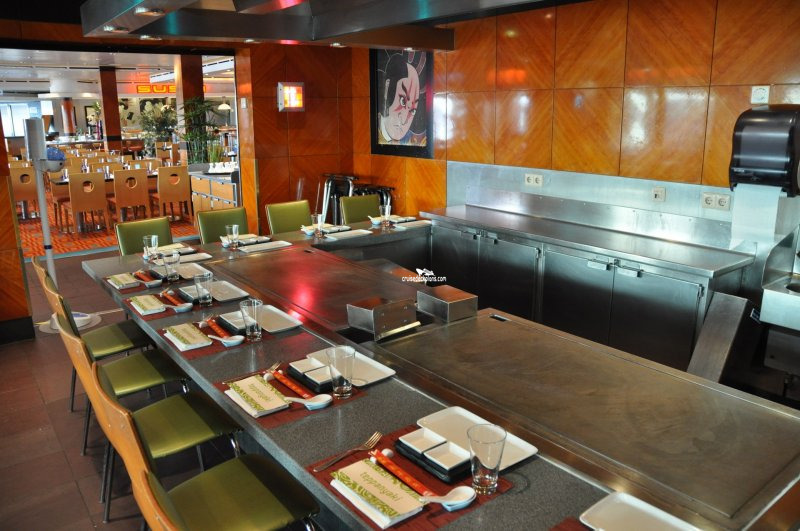 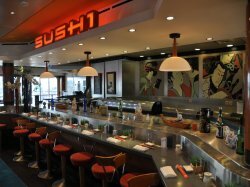 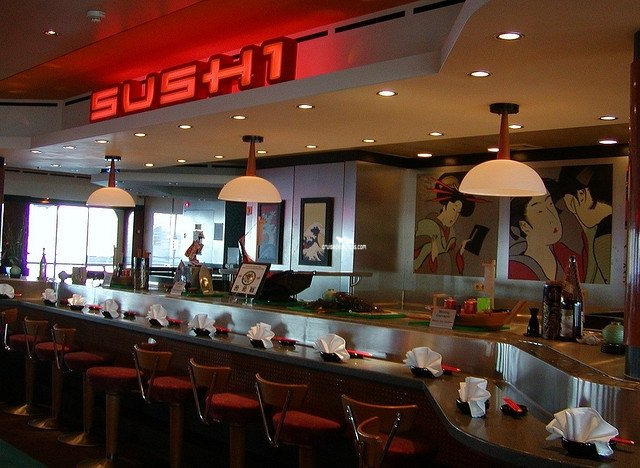 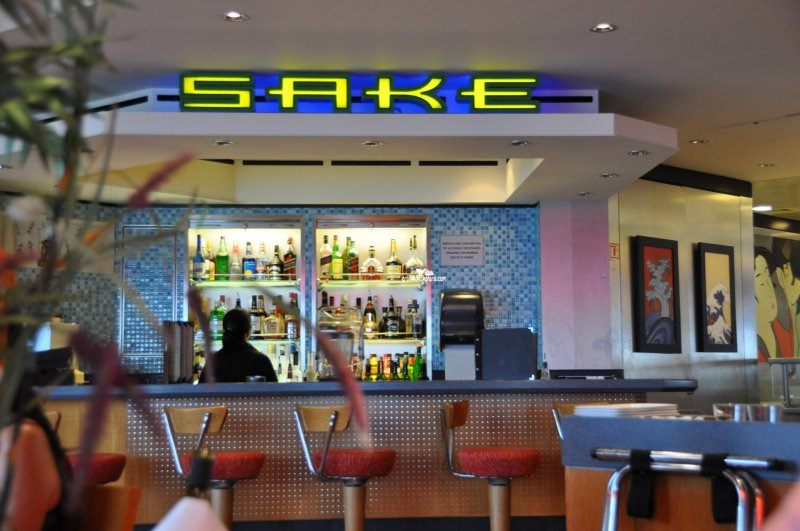 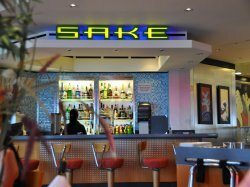 It serves Japanese sushi and sashimi expertly prepared as you watch. Open from 5.00pm to close, and offers guests premium sake and imported beer in a cosy environment within the Ginza restaurant. Plays host to musical performances and demonstrations. 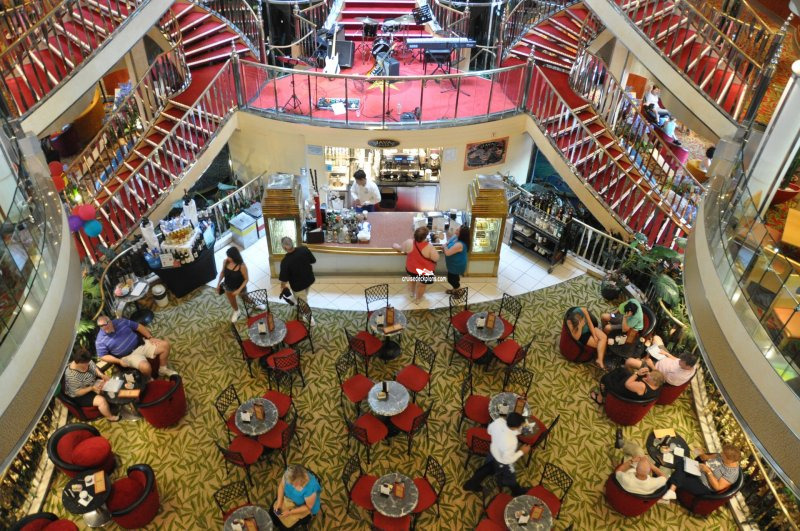 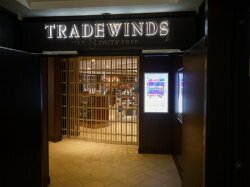 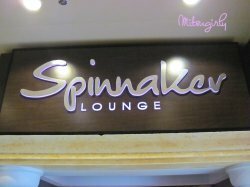 Guests can grab a coffee from the nearby Java Cafe during the day or cocktail from the same place at night. Sells a range of products from Swarovski jewelery, watches, clothes and accessories to tobacco and liquors. 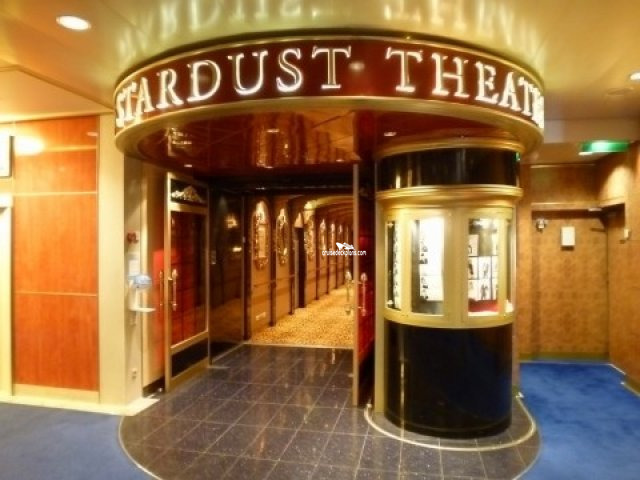 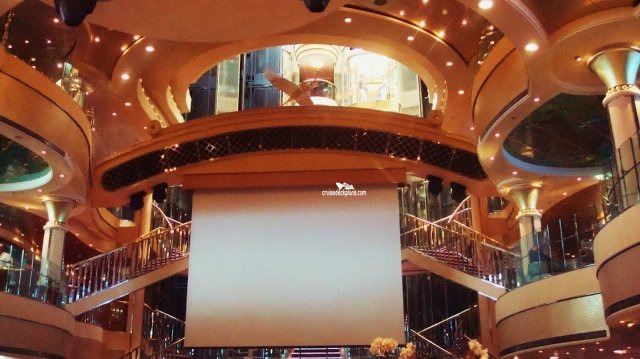 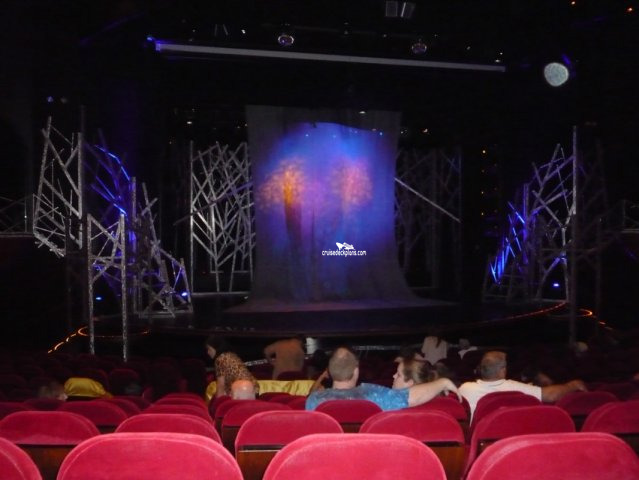 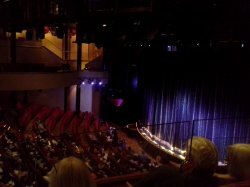 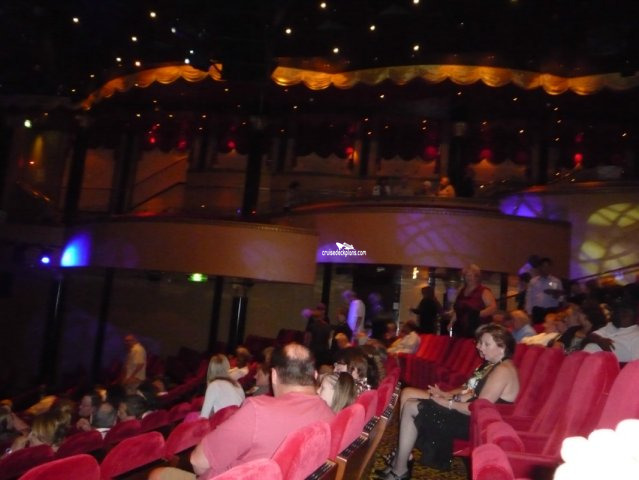 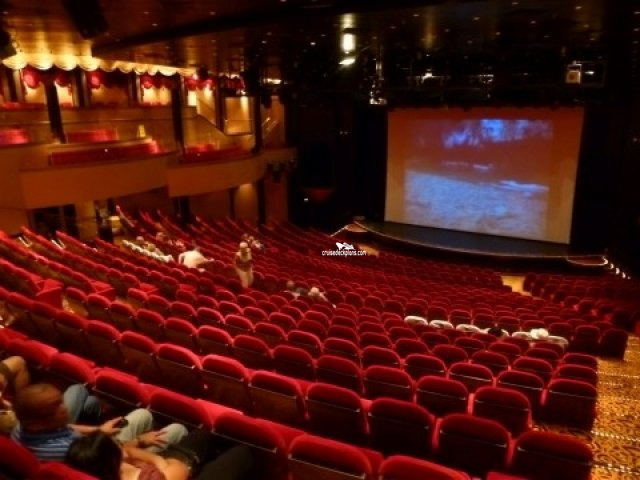 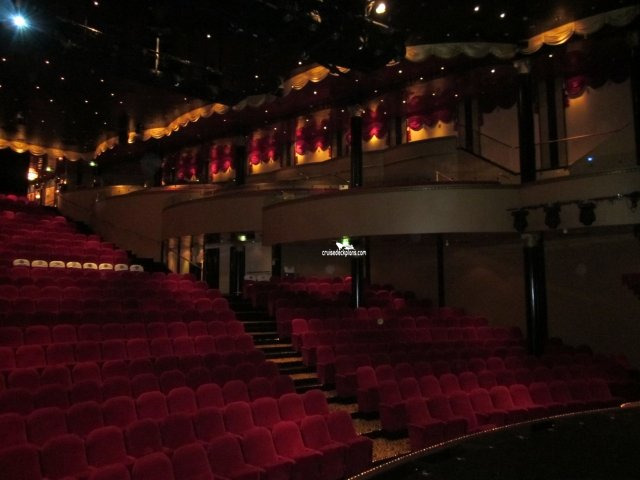 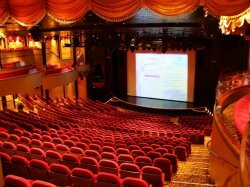 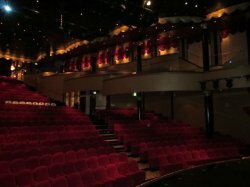 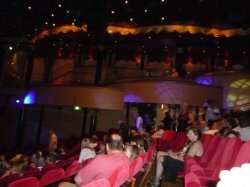 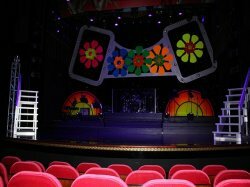 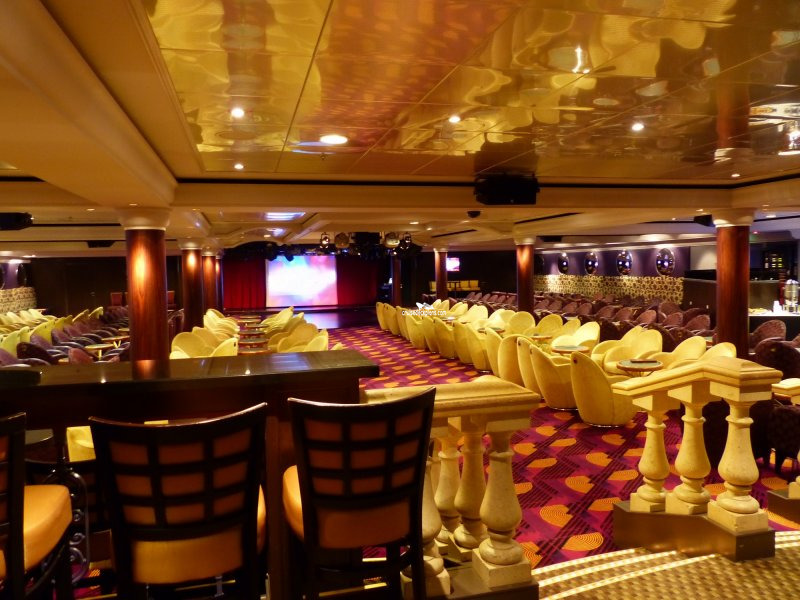 The ship's three tier main entertainment venue playing host to the ship's production shows. 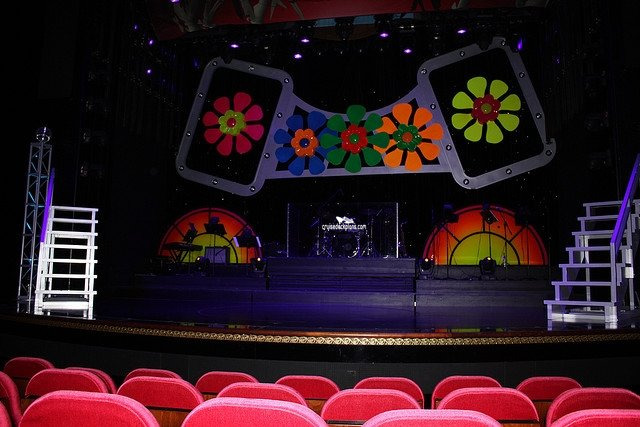 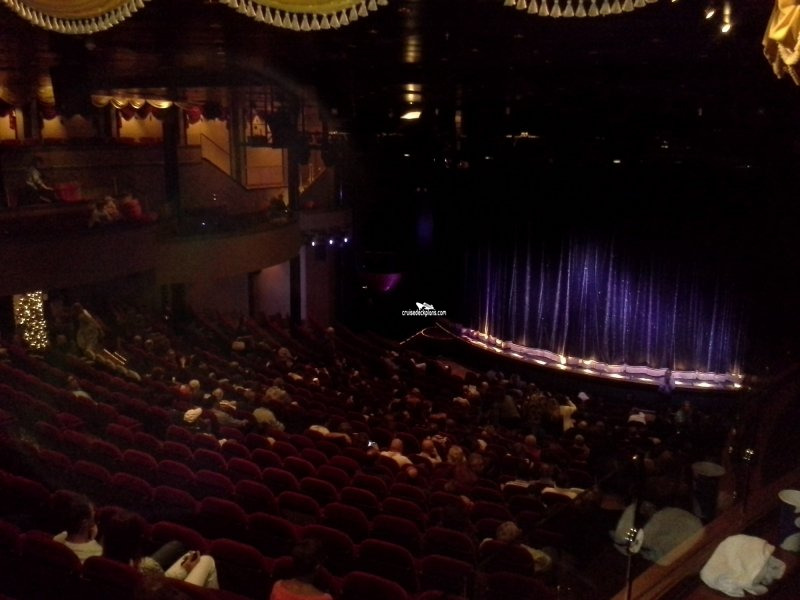 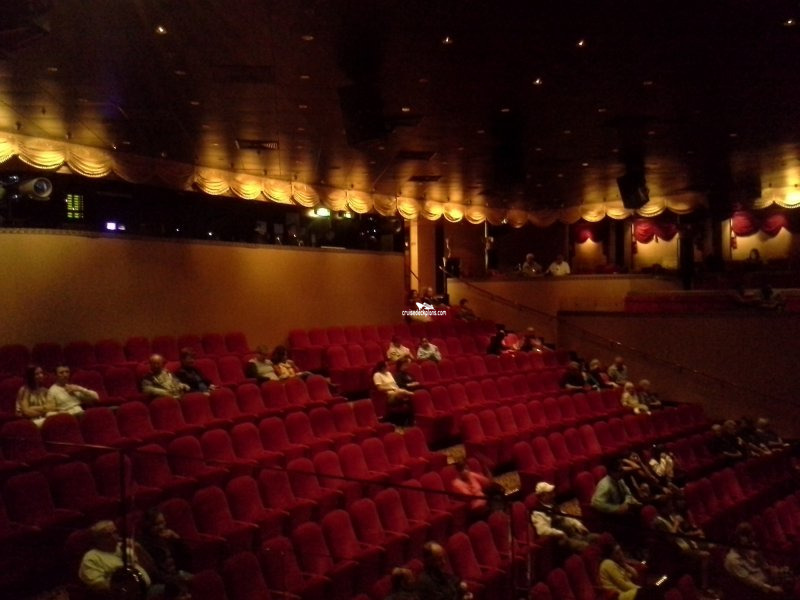 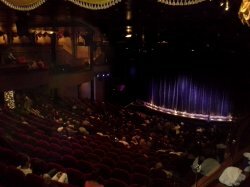 Seating 1037 guests, performances are held at 7.30pm and 9.30pm and shows range from “Shout! 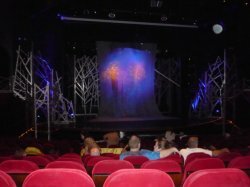 The Mad Musical” and Extreme Vegas (featuring illusionists, stunts, aerial acrobatics and comedy) to “The Second City” comedy performances with sketches and improvisation.